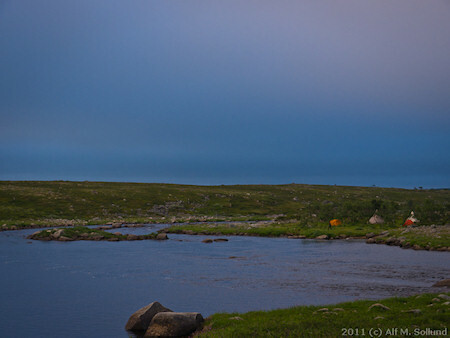 We settled camp on SecondKnee, in the best of weather imagineable: a a glowing sun, no wind and temperature just below 20 c. The group, consisting of some really veteran fly fishermen, some with more than 40 years of fly fishing experience, quickly spread out on the shallow rapids and slow, flat pools around camp. A couple of hours of fishing settled the terms; a few caddis hatching but very few fish rising, water temperature of 13 C and exceptional low water. We landed more than ten fish before the approaching august darkness brought us back to camp and chef Ilyas wonderful dinner of soup. A mix of streamers and Streaking Caddis was the patterns to trust this evening and obviously some parts of the river had a surprising concentration of trout. 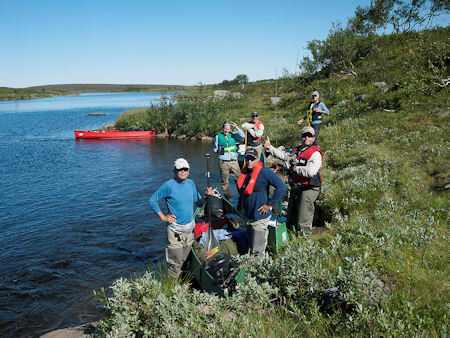 The second day we all went upstream, except for Bjørn. He was staying around camp and had his best fishing day ever, catching eight fish , the biggest 3,8 kg. It all happened in a short strech of the river, and it certainly must have felt like a day in paradise. 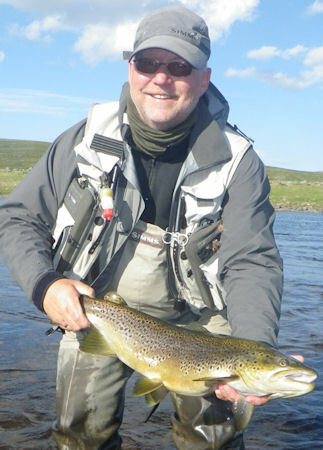 Bjørn was using all types of patterns, small dries, buggy attractor dries, nymphs and streamers, the fish seemed to bee in the mood for any offer. The five of us spending the day upstream had to do a little more search for the trout, but Jon got it all right by catching six nice trout on dries and streamers. The nice weather continued an we had som fantastic early morning fishing when the sun lifted the fog from the river and raised the temperature from below zero to comfortable t-shirt weather in less than an hour. 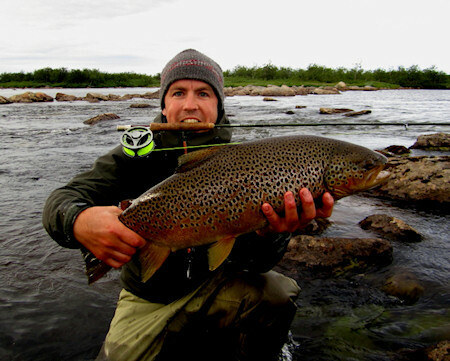 Bjørn raised the biggest fish on Litza, 4,2 kg, and confirmed the benefists of the experince of a long life in fly fishing. Even in Kola rivers. Kharlovka was a bit more demanding than Litza. 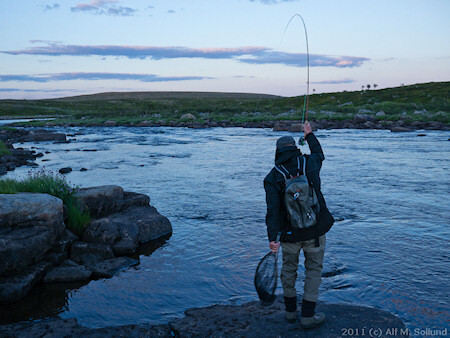 The tail of the pools was the place to fish and late evening the best time to put in a full effort. Very few fish was rising and streamer was by far the best method. The Lake at the head of the camp water surprisingly gave up a few nice fish, a place not to be overlooked for groups in the future. 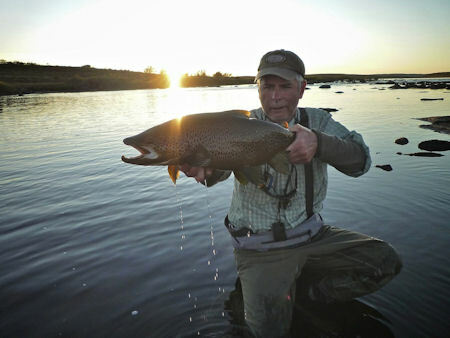 As for Litza,, the biggest fish on Kharlovka was 4,2 kg, caught by Svein on the last evenig of fishing.. 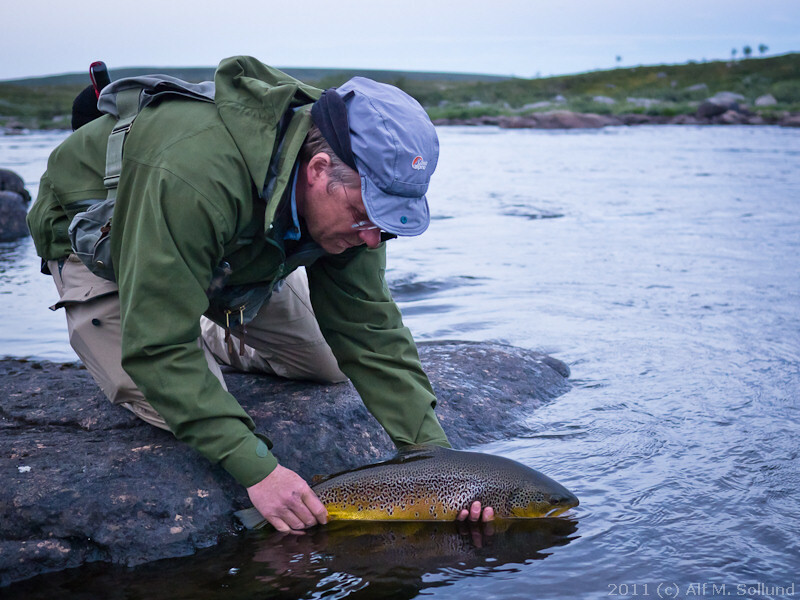 It certainly felt like a salmon and got stucked two times under big rocks, before safely landed and.released as his biggest trophy from the tundra so far. Thanks to chef Ilya, a true master of the soup. In total we caught 89 fish above 1 kg. Next morning I wake up early 06.00. The tundra is all white and fog is covering the river. The sun struggles to slowly warm up the air. I been freezing Whole night, so I decide to go and fish before breakfast. I didn’t catch any fish the evening before so I want to try. I am lucky and unlucky. Got one on my kola killer, 3kg and lost one that broke my leader 026. At breakfast we made plans for todays fishing. Børje and Mikael went to Dreampool and the rest of us went upstream Oset. Halfway up Saverio caught 3 trout, biggest one 1.7 kg. In the tent that night we talked about what we experienced so far. Morning fishing okay, fishing to 11.00. then nothing. 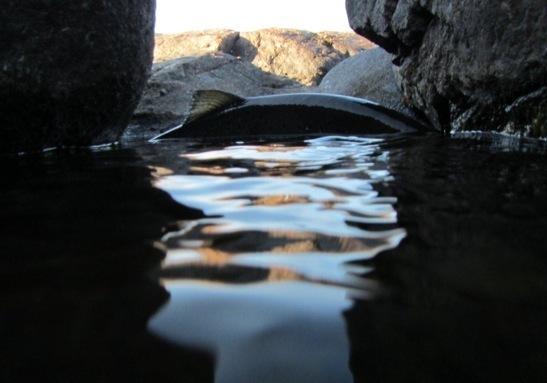 When the shadow start to cover the river, the fish seems to get more active and we discovered that most of the big fish was not hiding in the stream but in the waters between them, and got active for an hour when it started to get dark. We had beautiful weather hole week, clear sky and sun. Warm up to 23c, but cold at night. Next morning Børje caught a trout at 3.3kg. He was fishing from the rubber boat just near the camp, same place where I got my 3kg. 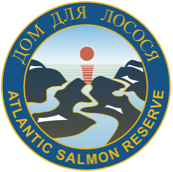 Is this the place were big trout were hiding? 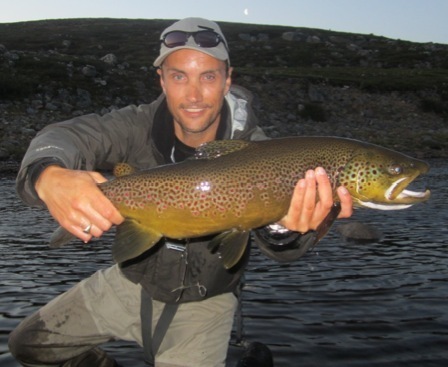 Could be, because later that evening Saverio Tarchi caught 75cm big trout there. 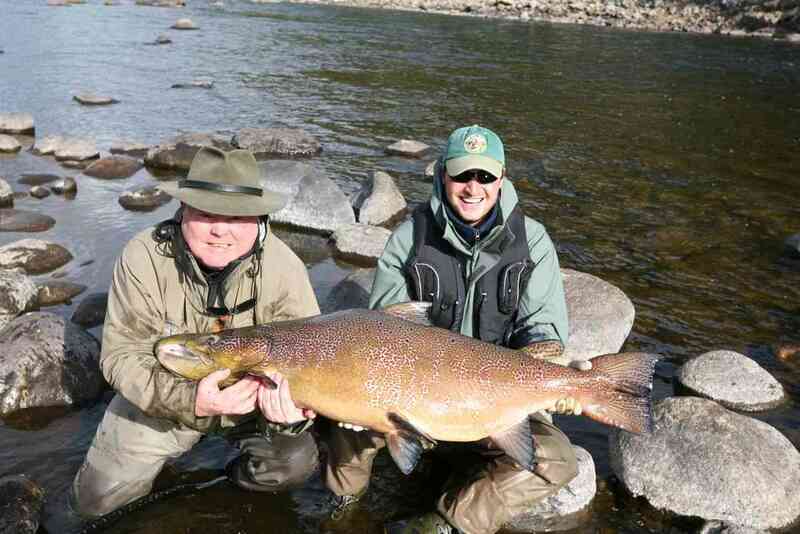 The biggest trout we got this week. Gino and Erik went up to Dreampool. After a long days fishing Erik was not so happy. 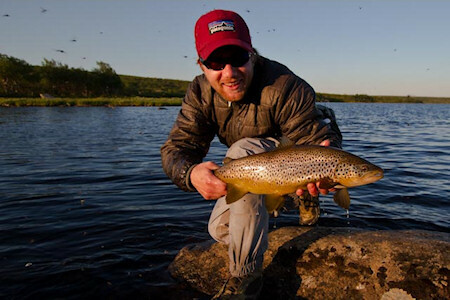 He tested almost every fly in the box without any luck and now it started to get dark.He took up a big,big zonker 10cm and made a final cast…. Bang!!! He only felt the fish for 3-4 seconds and snap… gone.. leader was broken. (0.30) -What was that!! He did not see the fish, a pike maybe? 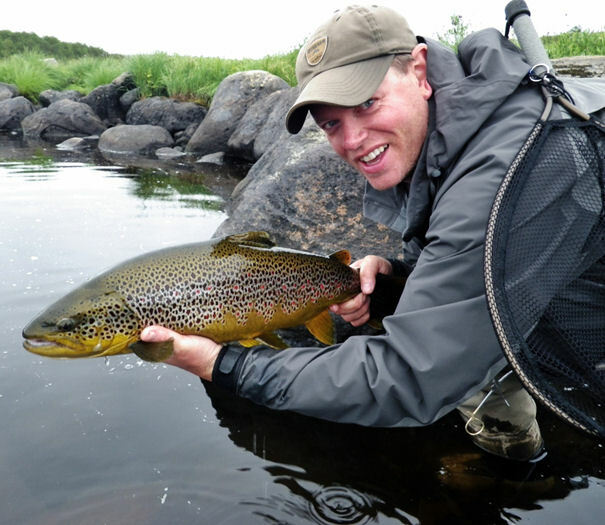 Sad for Erik that he never saw that Salom 6-8kg that took his fly…..
Well, I did the next day. 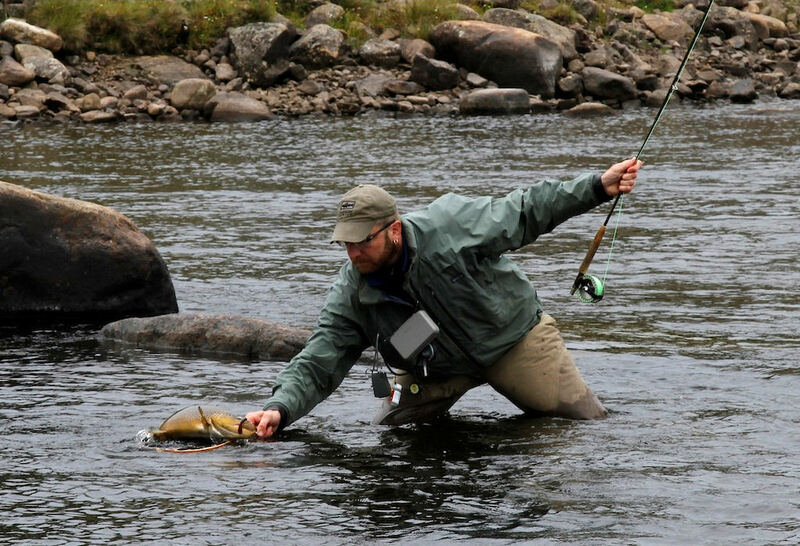 I was following my fly on the water when a Salom jumps up about 8m from me, and I could clearly see Erik’s fly hanging outside the mouth of the salmon. That was a big fly Erik!! And a big fish! Later that evening in the tent we all were happy after a good days fishing and have to empty some Russian medicine bottles. Gino and Erik had been fishing downstream and caught 15 trout. Good work boys! So the next day, we all went down stream and got a nice day with fish striking our flies. 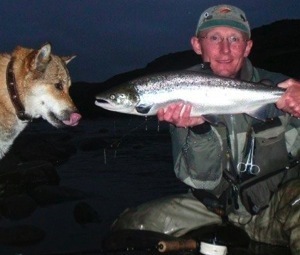 And as cream on the cake Erik got a Salmon at 4.5 kg. 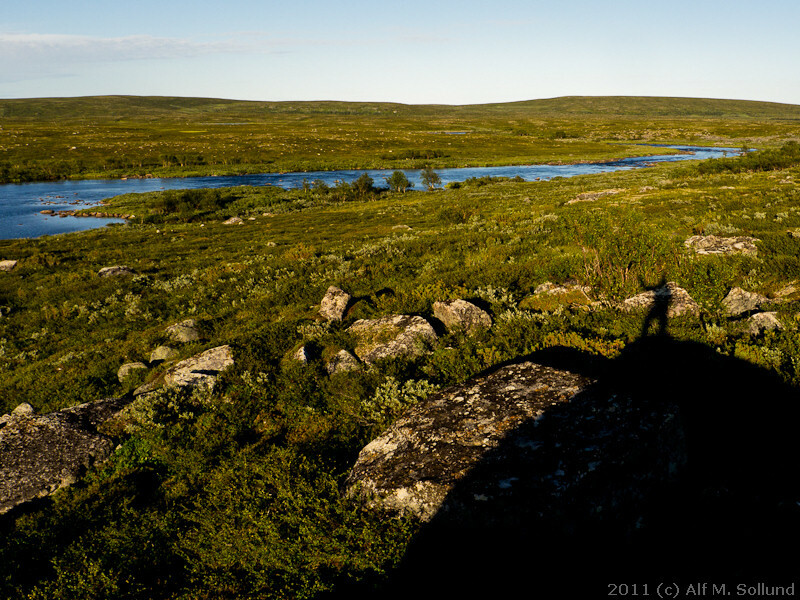 That evening we saw two wolverine 150 meters from our camp. Last day weather changed, a ice cold wind from northeast told us that is was time to leave Kharlovka for this time. Totally we caught 77 trout and one salmon. I like to thank you all for this week. We had wonderful weather, We had to work really hard for every fish, and that paid of. And if Gino didn’t had that lemming under his tent, he would probably had catch a few more… To Igor who made good food and made it all so easy for us. Every trip to Kharlovka or Litza is a memory for life. Thank you. Anders Wartiainen, Frode Heiestad, Jon Sigmond, Eirik Nedkvitne, Marius Warnken, Igor (Chef), Svein Røbergshagen (group leader). 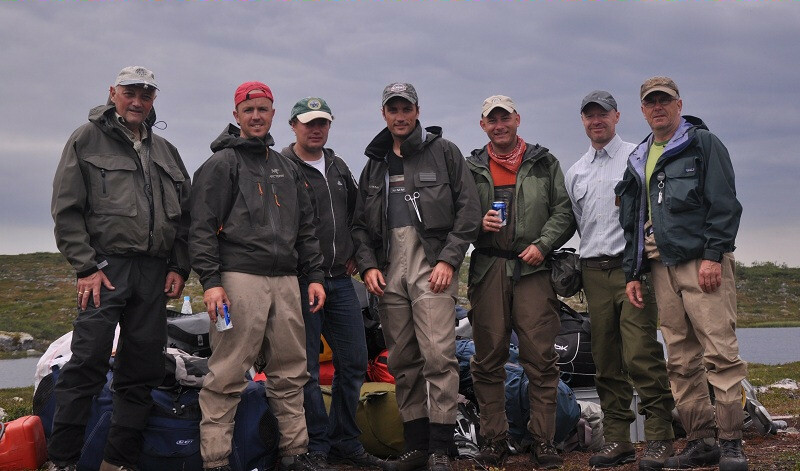 Saturday evening six exited fly fishermen, all experienced from previous trips to the tundra, arrived the famous Wulf’s Lear, the camp known for its exceptional ability to give up some of the biggest trout on the tundra. The weather was rather on the nasty side, windy and cold, but the river was still in good shape, with low water and 13 C. Igor settled camp while watching the Home Pool and immediately reported rising fish. 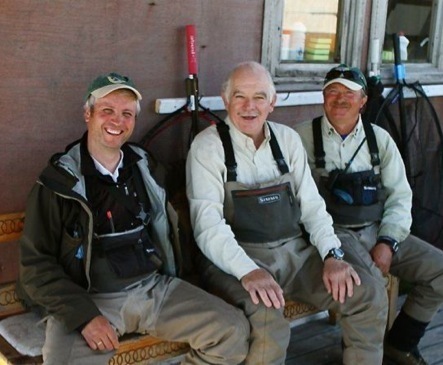 The only one instantly not in his waders was Jon. 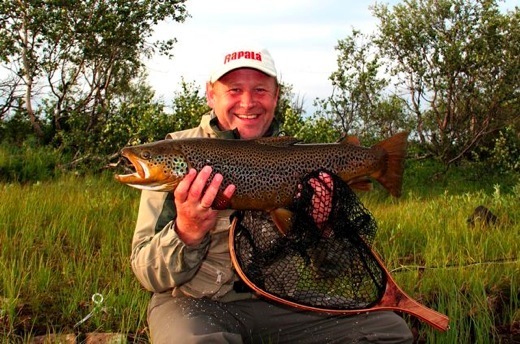 Still in his camp boots, he grabbed the rod, put a Stimulator dry fly softly on the water a few meters from Igors kitchen tent, and landed a 3,4 kg trout. 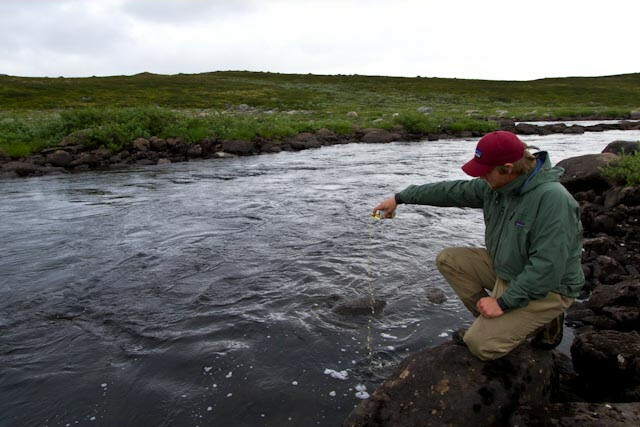 For the rest of the trip he claimed waders to be a waste when fishing the tundra at low water conditions. 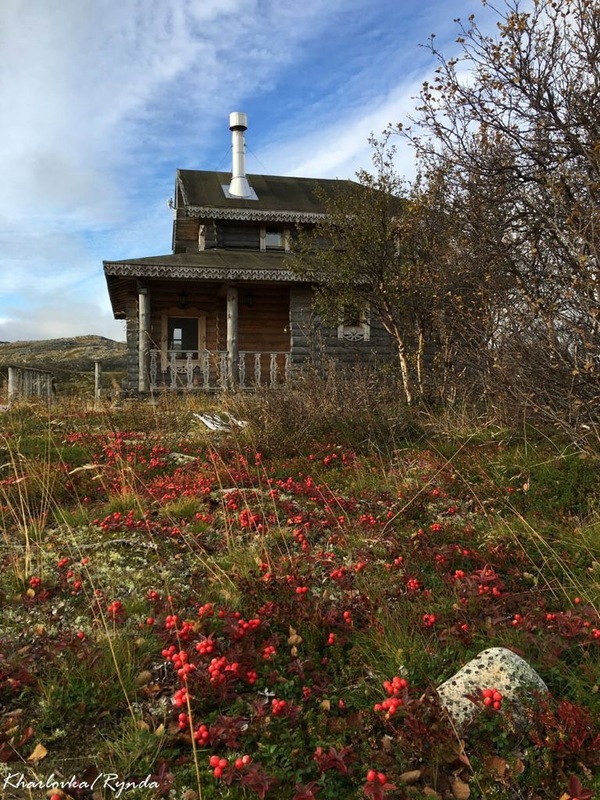 The cold weather continued for the rest of our stay at Wulf’s Lear. We did see a few fish rising but mostly we searched the river with caddis patterns, carefully covering every likely spot to hold a trout. 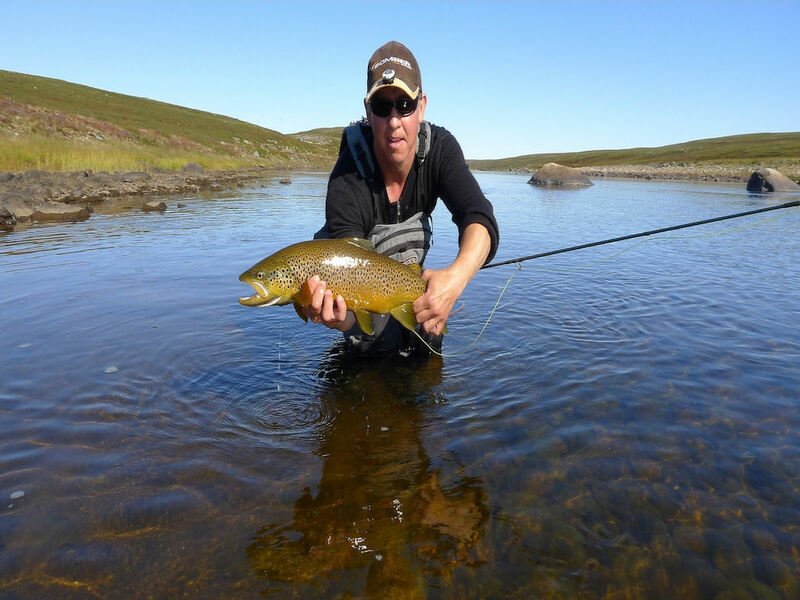 The dry flies were accompanied by streamers in the tails of the pools, and with the abundant population of lemmings crossing the river, the trout could not resist this big fly offer. Anders landed a 3,7 kg trout, the fish fighting furiously, close to a rapid. 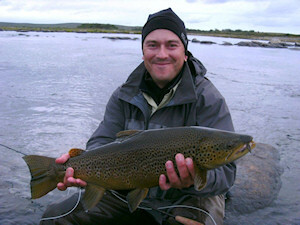 It was the biggest fish at Wulf’s Lear, joined by several trout in the 3 kg range. Dream Litza was also exceptionally low, but the fish was a bit more eager to rise. As the weather warmed for a short time during the day, a couple of mayfly species hatched in quiet good numbers. 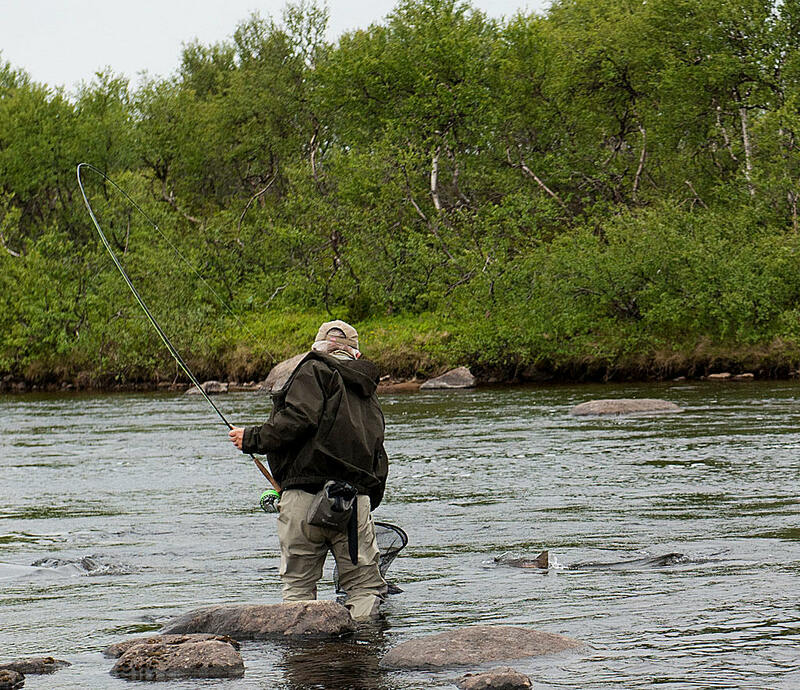 Even the shallow flats below camp gave up fish and when a few glimpses of sun highlighted the stream bottom, we could spot fish waiting for our offers. The best working streamer was by far a Zonker type fly with a deer hair collar, making fish speed for the fly from far away distances. The catches on dream Litza were some times far beyond our expectations, the biggest fish 4 kg, and several fish above 3. kg. For the week in total we landed 73 fish above 1. kg. 11 fish were above 3 kg. Thanks to Igor, again the perfect chef and the best of company in camp, always contributing to making this week a fulfillment of fishing dreams. Report Week 10B – Scones/Swan. Group Leader Tom Tuskin. From left: Igor (our chef), Karol Pastucha, Tobias Gønther, Jan Varchola, Harald Weidler, Tom Tuskin (Group Leader) and Kurt Soyka. 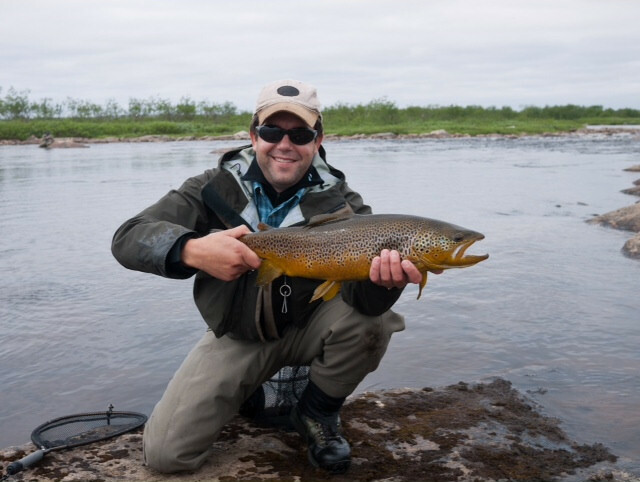 None of the foreigners had never been to the Russian tundra before and were positively surprised by the beautiful rivers and the seamless and professional logistics around the Trout program provided by Kharlovka Company. And as you can see from the pictures we had a marvelous week even the conditions varied a lot! 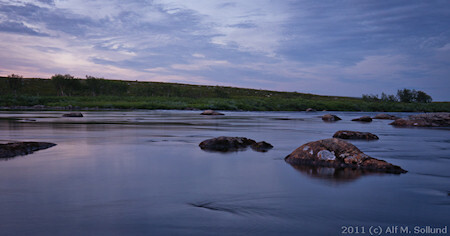 We arrived at Scones Kharlovka Saturday evening and started fishing the stream by the camp and upstream by the old hut. 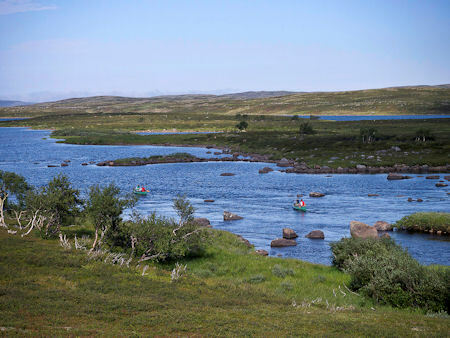 The first day was not perhaps the best but the next day we went downstream with the boat and fished the campsite more thoroughly this gave us some fish. 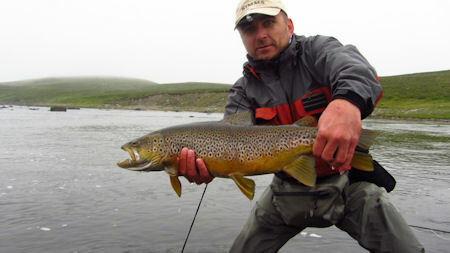 But with warm low water level and no hatching insects the conditions was not perhaps the best at Kharlovka these days. I few of us caught some trout but if we would have some hatching I’m sure the fishing would have been better at Scones. We had a couple of great days and had high hopes for better fishing at Swan Litza when the chopper arrived Tuesday afternoon. 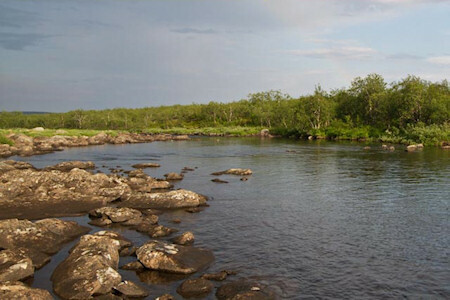 Tuesday evening we arrived at Swan Litza in beautiful sunshine and what a great camp site and wonderful river! 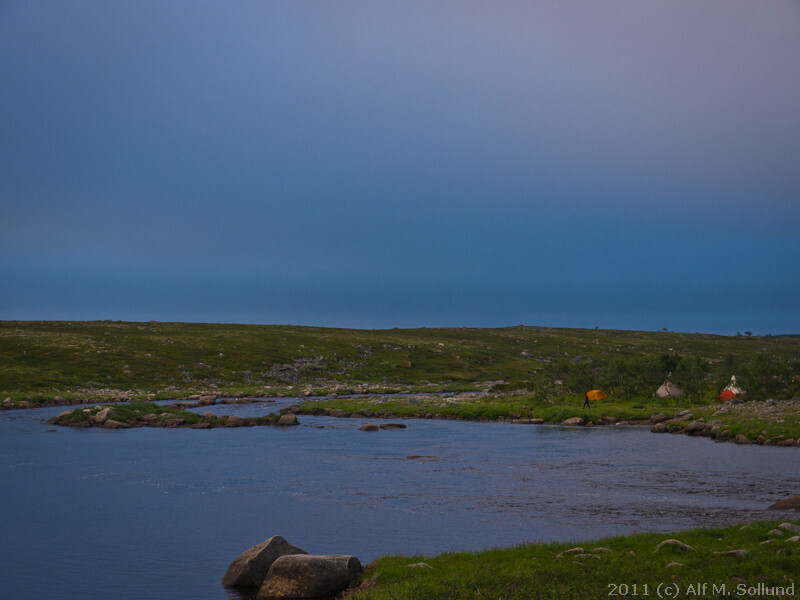 We sat up camp and started to spread out between the different Isles and streams at Swan. It wouldn’t take long before the first big brown was hooked. 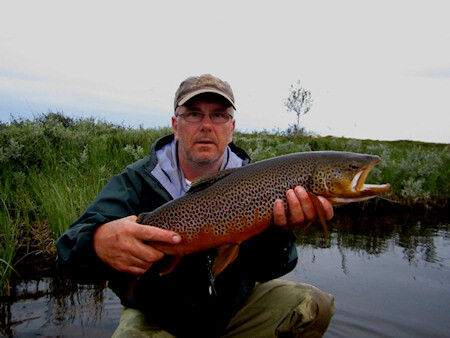 All of us caught some very nice fish this first day at Swan Litza and this continued the next days. Overall most of our fish were caught at Litza also the biggest ones. 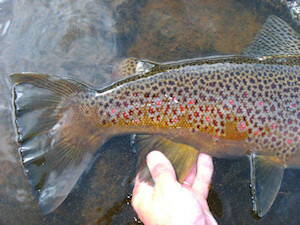 We suspected that some of them were ready to spawn already and that might explain why they had so beautiful colours. During our stay at Litza we had very little hatching of insects and that was maybe the only thing missing during our week. 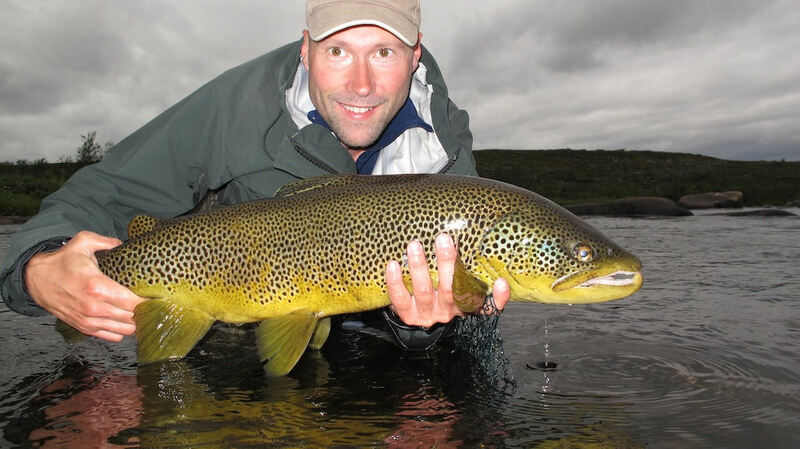 But we still made the trout rise to our flies and the most successful fly at Litza was a huge Austrian version of the streaking caddis. 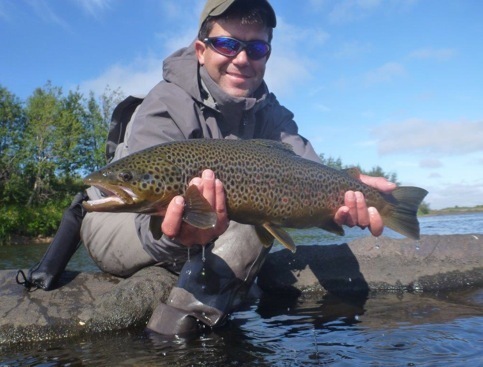 Almost everyone in the group caught trout over 3 and 4 kg which proves this is probably the best wild brown trout fishing you can experience in the world!! As the pictures show you all can see we all experienced some special moments which we will remember for the rest of our lives. 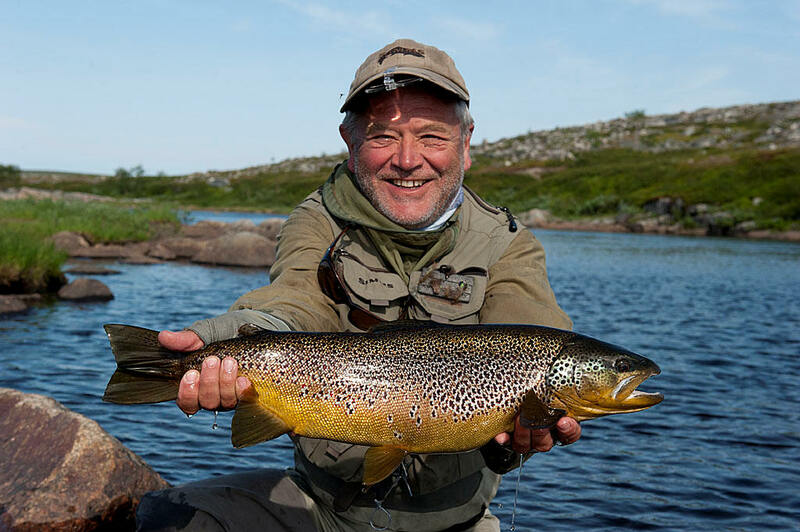 I must say I really appreciated taking 5 fishing buddies from central Europe and let them experience Kola wild brown trout fishing at its almost very best. 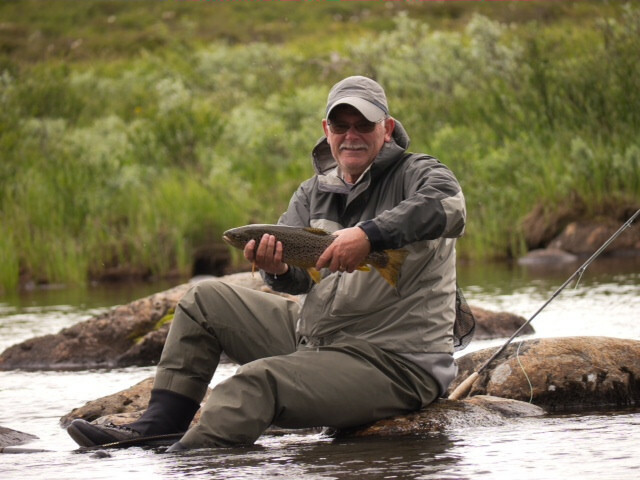 A majority of our fish was taken on dry flies and almost every day was another day with new experiences with fish of a lifetime. 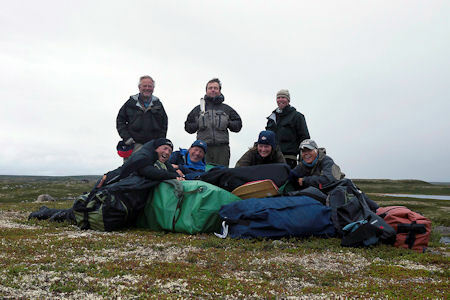 The whole group would also like to take the opportunity to give a big thanks to Igor who is always smiling, makes excellent food and gives valuable Tundra advice. 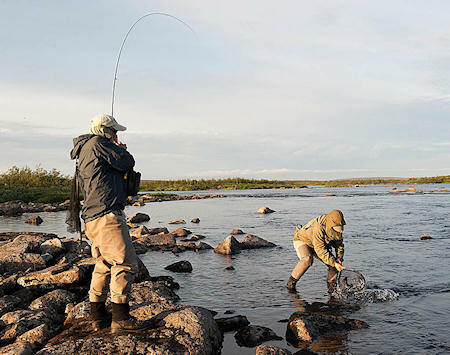 All of us got new unforgettable moments regards to fishing and also with weather and nature sights! We will be back! Pal Krogvold and Kjell Sømme. For the first time we had two women with us. 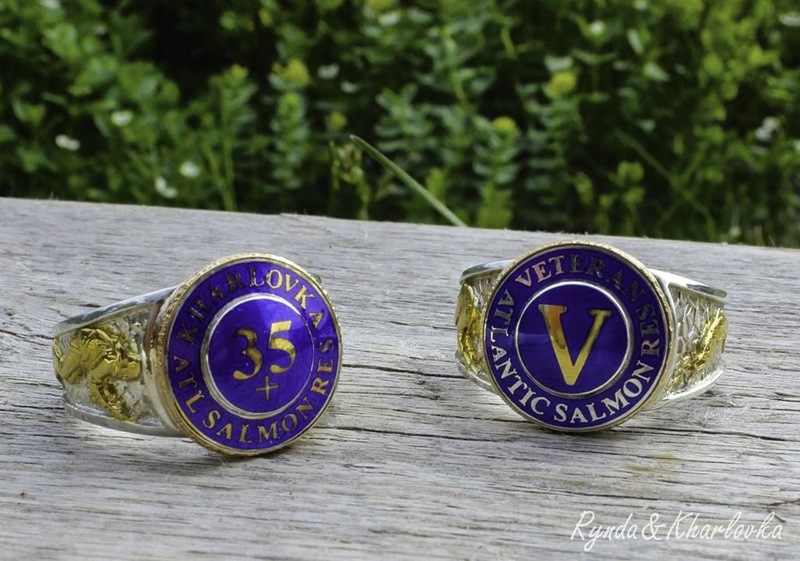 Both had a lot of fly fishing experience, Solvor also from places like the US and New Zealand! We started at the lake Torisman and found that the Rynda had even less water than we experienced in June and the fishing was really difficult. No hatching on insects we could see. 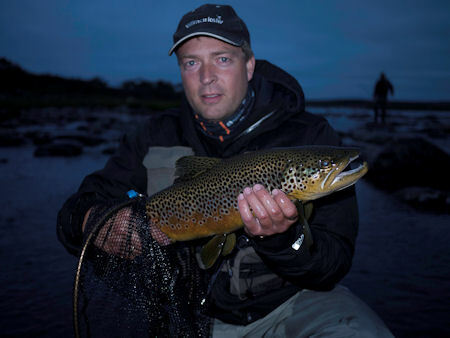 But at night big fish started rising in the pool below the riffles, so something brought them to the surface! But hardly any fish was being caught! We started to roam the other parts of the river. Some had some more success further upstream on streamers and well known attractor flies. But nobody found the insect that brought the big ones to the surface, but we assumed it was some very small caddis. The weather had been cold and windy for two days when summer suddenly reappeared and we moved downstream 6 kilometres. Everybody were in a good mood and hoped for better opportunities at this beautiful place. And we did catch some more fish and we were a bit more optimistic about the fishing. 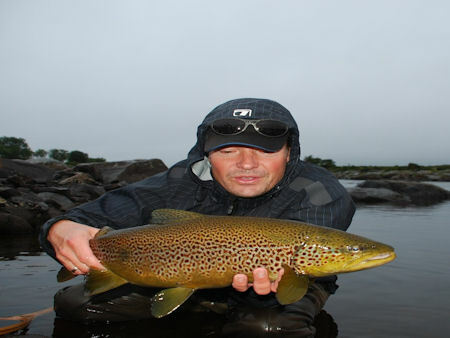 But the weather soon turned to worse and so did fishing. In all we caught 34 fish above 1 kg. Although we had lousy fishing and weather the group kept up the good spirits and we had great fun at our long meals and many a good laugh. Hope to see all of you back on Kola! 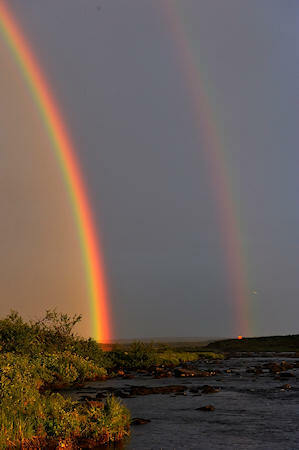 Text and photos by Alf M. Sollund. 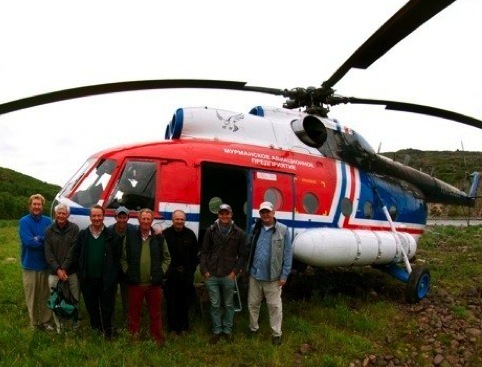 The group (from left): Alf Sollund (Norway – group leader), Martin Olav Moen (Norway), Erik Nerland (Norway), Steinar Simonsen (Norway), Thor Evensen (Norway, rookie at Kola) and Igor (Russia, our guide). 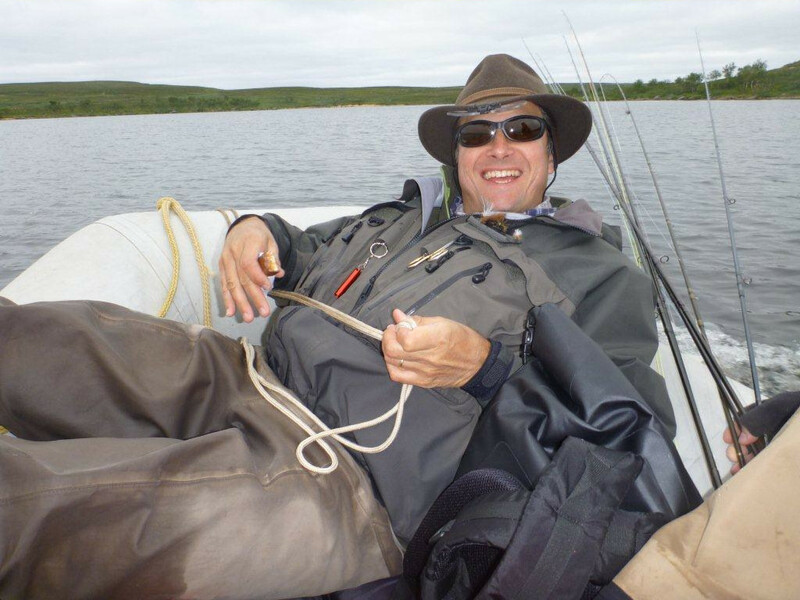 We would like to give our highest regards and thanks to our guide Igor and “Mr. Kola” at Rynda camp for taking care of us! 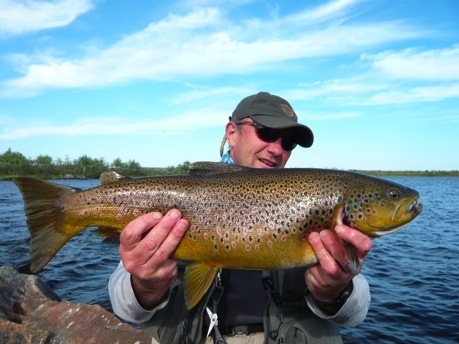 Our summary from week 9B (23.07 – 31.08.11 in Dream Kharlovka / Bush Litza) is challenging fishing in various conditions on rising big trout. 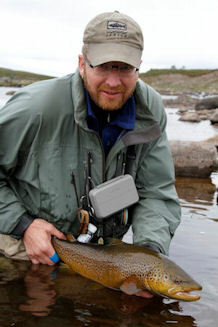 We had in total of 79 trout on 5 fishermen, and 6 of these larger than 3kg. We experienced some small hatches of mayflies during daytime, and quite intense swimming caddis spots each night at darkest. 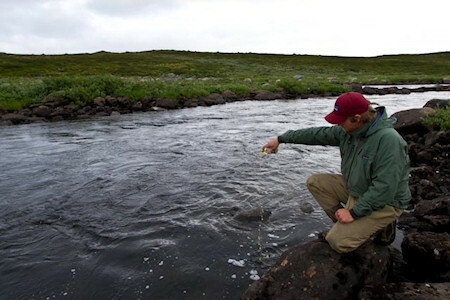 The water level was very low with water temperatures from 16-14 degrees, and from 30 to 6 degrees in air. Yet another splendid trip to the largest wild brown trout on Earth. 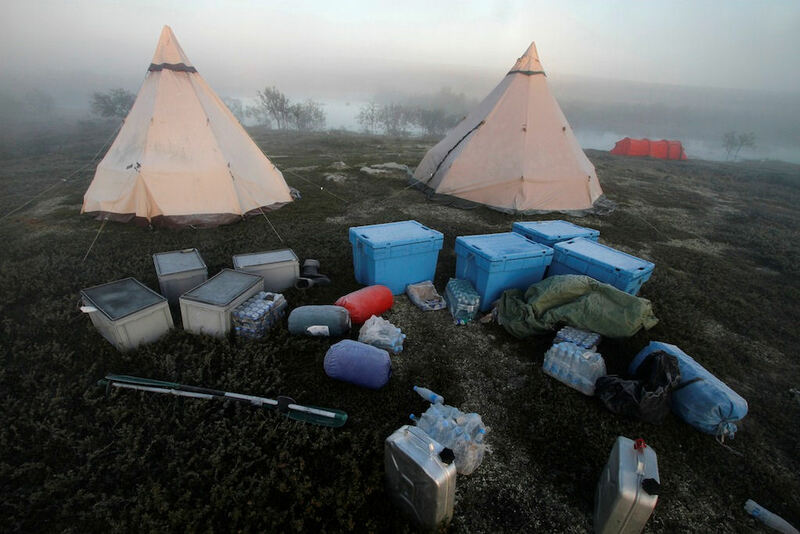 When we arrived at the beautiful Dream Kharlovka camp (picture 2) the weather was moderate warm with very low water level and a temperature around 16 degree. Perhaps a bit to hot? 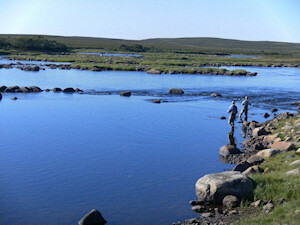 Still, after around 10 minutes fishing the first two trout were landed in the “Home pool”. 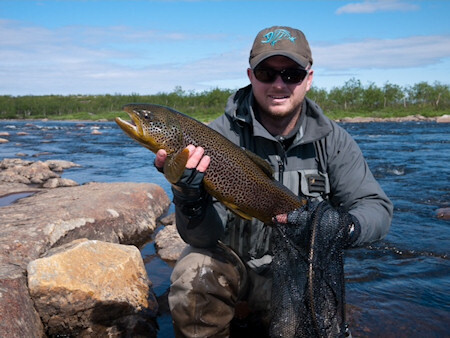 The next two days were incredible hot, and the fishing was a bit slow with no hatches except swimming caddis pupae in a few spots around midnight. The fish did however rise to dry caddies (Martin hooking one in picture 3). 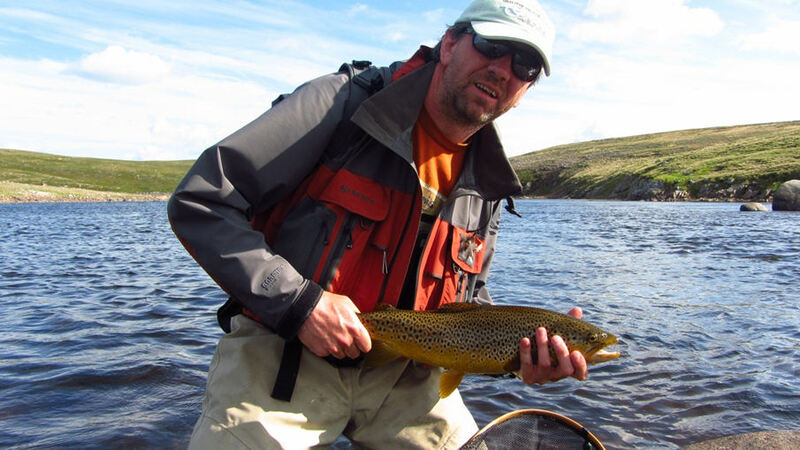 This fishing proved to be really challenging with a lot of rising large trout that didn’t care about our flies our presence at close range. We had a few trout taking our dry caddies and even mayfly emergers during these pupae runs, but we clearly did not hit the correct imitations this time. Luckily it rained heavy during day 2, and the following 3 days the water level increased although it was till at the lower side (lake neck around midnight in picture 4). Both water and air temperature dropped a bit. 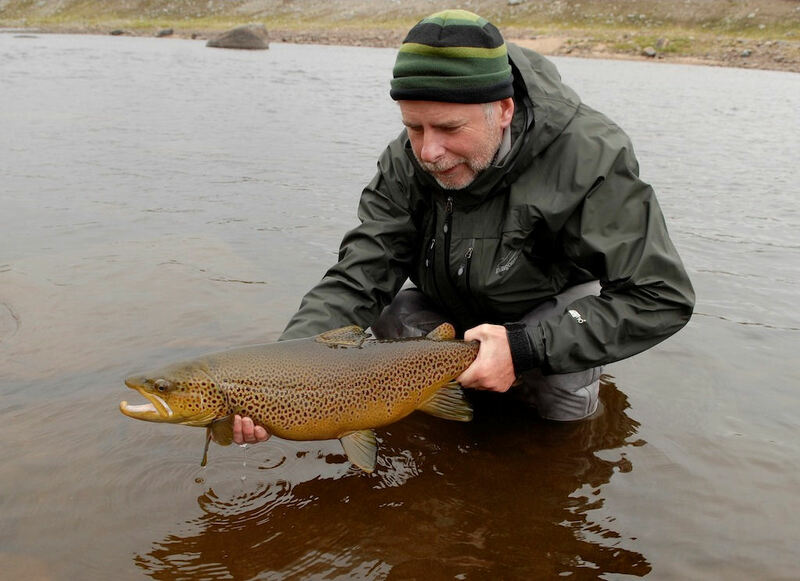 The fish seemed a bit more willing to rise to our dry caddies (Alf releasing a nice trout in picture 5). During these days we had a fair amount of small biting black flies, nicknamed the “Satanfly”. Our rookie Thor woke up one morning he heard a rain on his tent. It was not raining, it was 10 000 000 000 black flies between inner and outer tent wall! 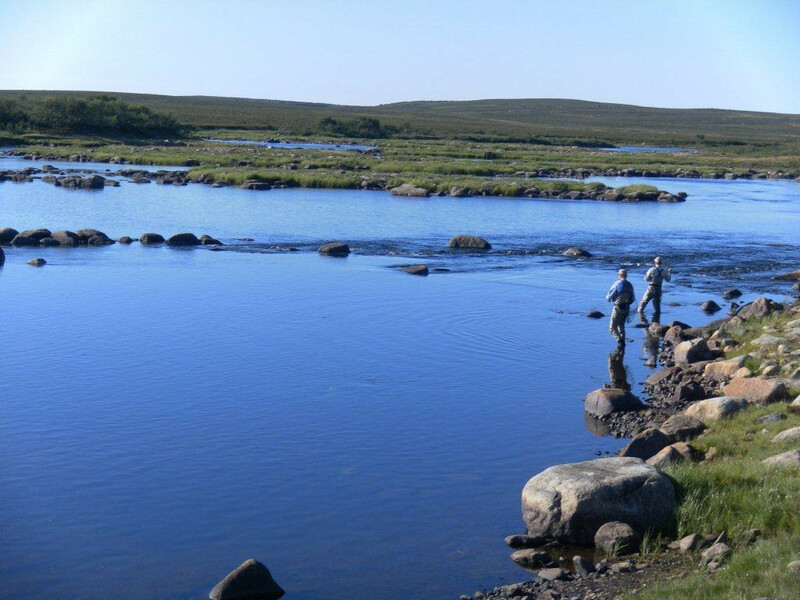 The fishing was still difficult but we had the occasional hatches of mayflies hook size 12-14 during both daytime and late evening (Alf releasing trout in picture 6 taken on dun in late evening). It was difficult to predict when, so Steinar decided not to sleep in order not to miss it. This tactics proved only marginal successful. There was also heavy “hatches” of lemming. They were all intent to migrate towards Murmansk, and several hundreds were seem swimming across the river, always the same direction. We did see a couple being taken in strong currents by what we believe were large trout, but did not have the proper imitations. Also a few were seen taken by pike. In general the trout took dead drift caddies such as Streaking Caddis and Stimulator. The longer the drift without drag, the better chance of take. Sometimes the trout could be triggered by streaking caddies across necks. 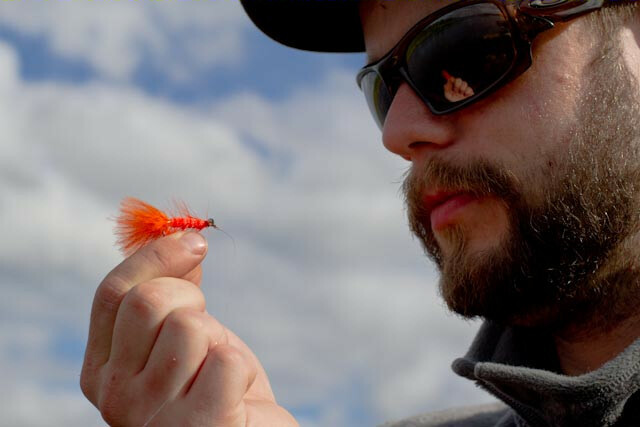 For mayflies we used quite large duns and emerges a bit paler that the real life flies, and when getting a good drag-free drift we could be almost certain of take. 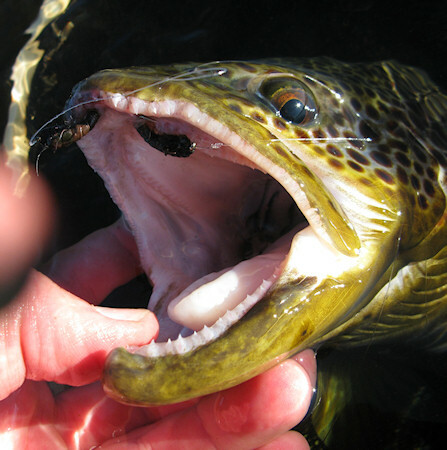 A problem with mayflies imitations are the hooks. All of Alf’s duns were tied on TMC 103, and all of these proved to be one-fish flies as the hooks was bent for each fish. Next year new hooks! Also this year Igor took great care of us, giving fishing advice when needed, and making the great power-boosting Russian soups and late dinners. He had to stand with irregular sleep patterns and people coming and going at odd times, but always kept his good mood. 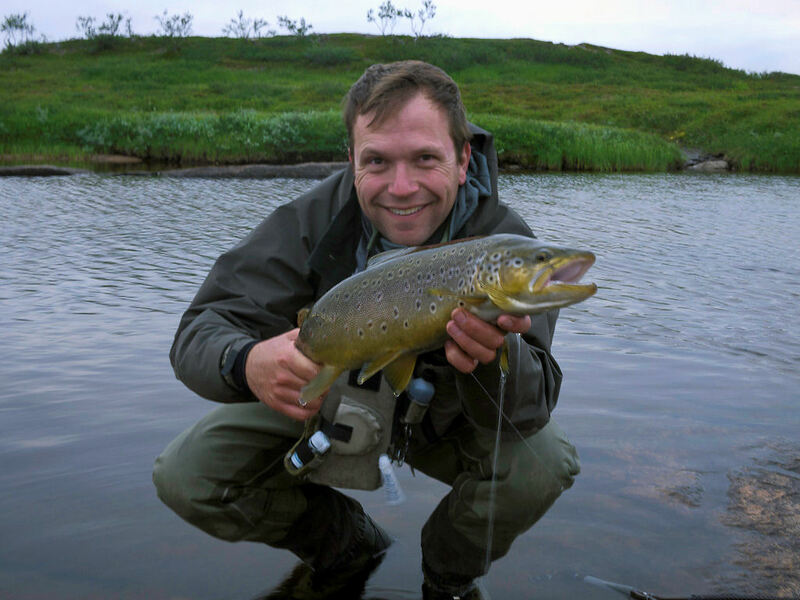 Nor, Roy, Per and Espen had never been to the Russian tundra before and were positively surprised by the beautiful rivers and the seamless and professional logistics around the Trout program. Are hadn’t been to Kharlovka before and I’m sure this was not his last visit. Both Kharlovka and Litza were quite low and we got quite a number of fish but it was not the quantity of fish which should define the success on this trip. We got some very big trophy trout and we experienced some special moments which we will remember for the rest of our lives. Our 4 biggest trout’s were impressively 4.7, 4.6, 4.2 and 3.4. (3 of them were caught on Madam X, never go to the Tundra without it!) 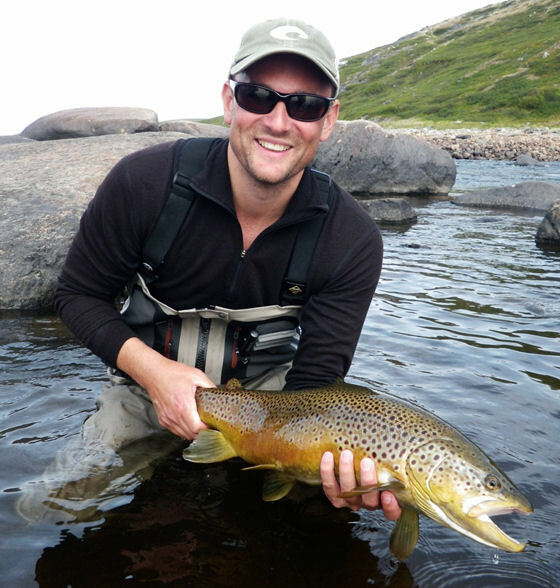 A majority of our fish was taken on dry fly and most of us got new personal records! These pictures below show more than a thousand words…! Espen and Per dotted the i on this adventure with their meeting with a big brown bear who were going for their lunch box. While waiting for the helicopter Espen went down to the tail of the lake outside Saami Kitchen camp and took a nice 2.2 kilo on a dry fly. Hopes this is a sign that the next group will get excellent fishing! 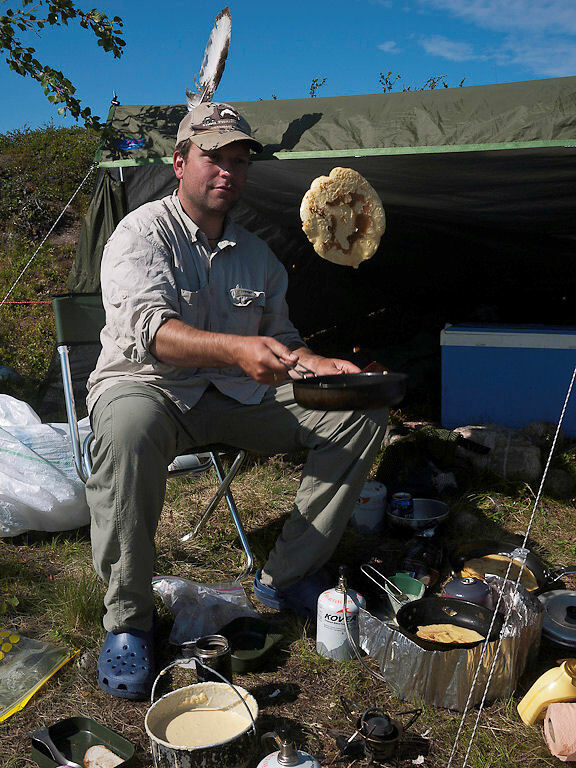 I would also like to take the opportunity to give a big thanks to Igor who is always positive, makes great food and gives excellent Tundra advice. The group consisted of Per-Erik Svenskerud, Lars Ninive, Jan-Erik Lund, Tor-Erik Fostveit, Roger Enger-Lie and Kjetil Hvarnes. 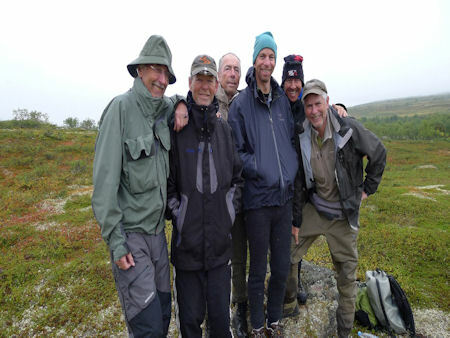 From left: Roger Enger Lie, Thor Erik Fostveit, Jan Erik Lund, Kjetil Hvarnes(group leader), Per Erik Svenskerud and Lars Ninive. We arrived at the tundra with excitement and quite a bit of hope for some good hatches. In good tradition we drew straws on who could make the first cast at Oset. Per-Erik was the lucky one and on the third “dead drift” a beautiful trout took the caddis imitation. 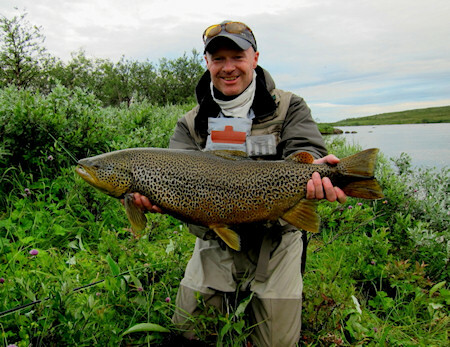 Jan Erik with his 3, 4 kilo trout caught at Oset. 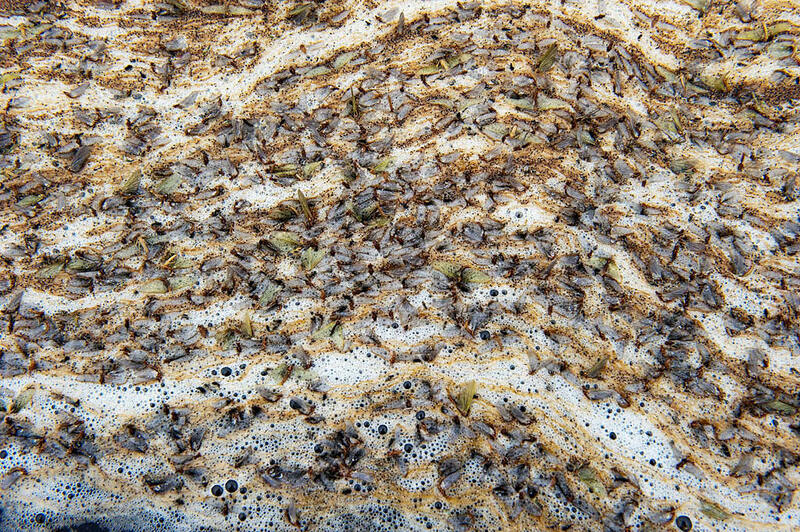 We had some minor mayfly hatches and one day with trout rising to caddis pupae at Oset, but most trout was caught fishing blind. The salmon was surprisingly already there and we saw some big jumps but they were difficult to catch. 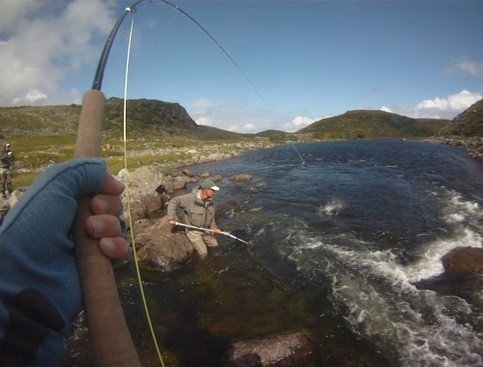 Lars displayed true fishermanship when he took the “trout around big rock, landing on top of little rock” trick and amazingly managed to get the trout unharmed and safe in the net. How the leader survived that is beyond me. 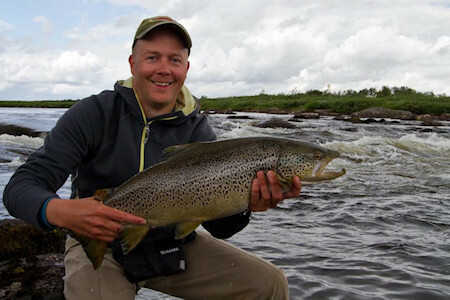 Lars with a nice trout. At First Knee the river was wide and shallow. 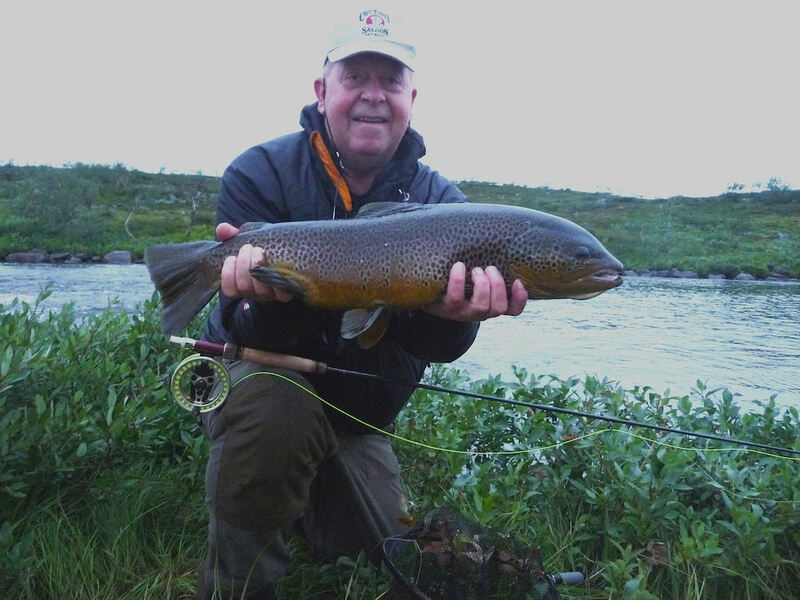 The temperature had slowly been rising since Oset and the first evening at First Knee we had really good fishing. 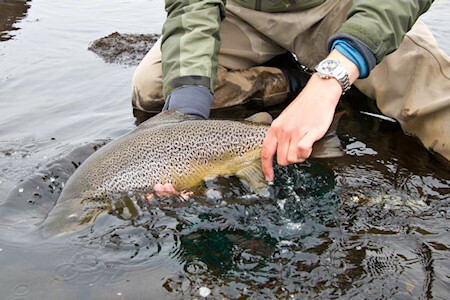 One would think that the trout stood in the deep channels of the river, but our experience was that the trout stood on as little water as possible in the river. 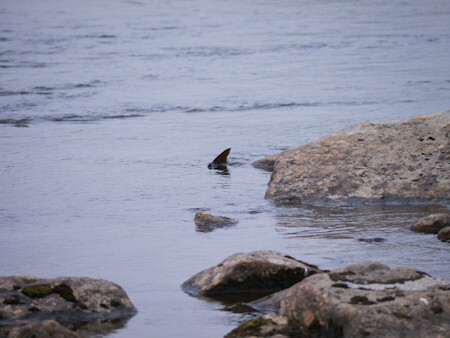 The trout also went up the river at specific times and stood on the river for some hours and then went back to the lake. 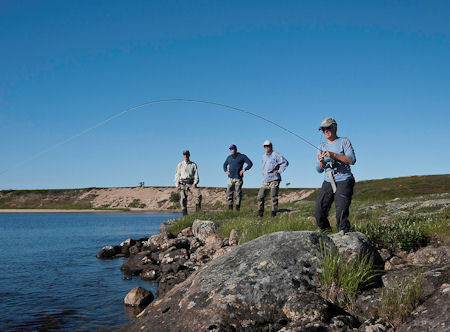 The fishing at First Knee was not easy, but we figured out the code quickly and adapted our fishing to it. Tor Erik with a beautiful First Knee trout. 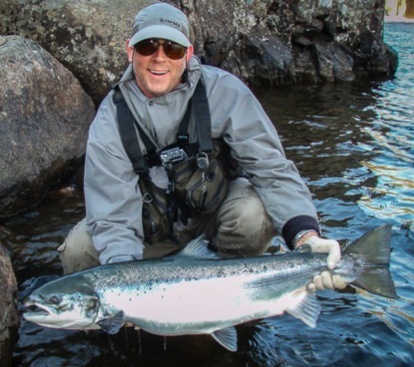 We also headed downstream and found some nice places with steady fish. 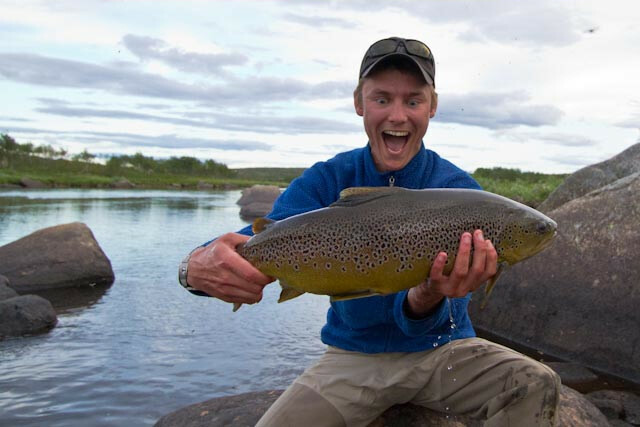 Kjetil with a 3, 1 kilo trout at First Knee. 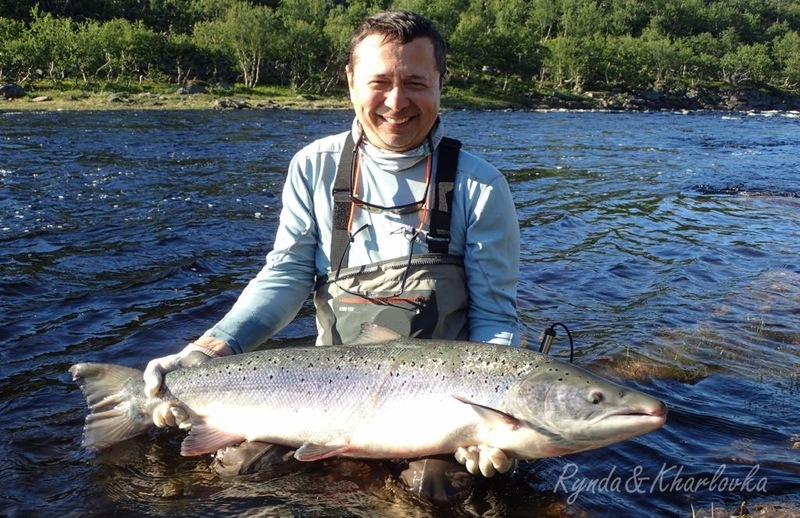 Roger with a 2, 6 kilo trout at First Knee. He looks happy. We used caddis imitations that made a solid print and silhouette in the water film. They were all fished “dead drift” and not striping. We also got trout on woolly bugger, kola killer, muddler minnow, madam X and nymphs. All in all this was a magnificent trip with personal record for 4 of the group members and the same record as before for 2 of the group members. During the week we got a total of 117 trout. 8 over 3 kilos and 1 over 4 kilos. All this could not be possible without Vasiiliev, who shared his tundra experience with us and made excellent food and was up as soon as we came tired from fishing. 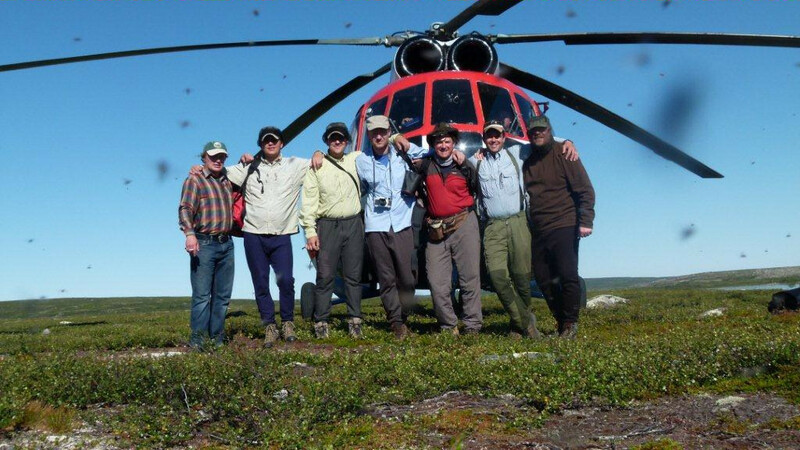 Group members: Lasse, Geir Ove, Magnus, Kristoffer, Erlend Welde (group leader) and Igor (guide). 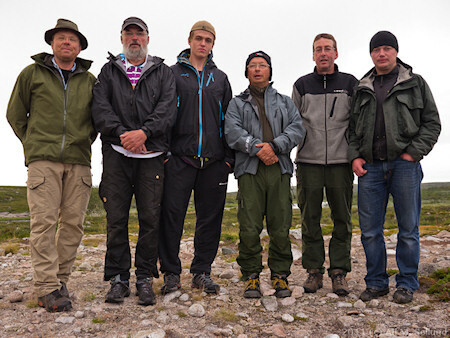 From left to right; Erlend, Kristoffer, Tommy, Geir Ove, Lasse, Magnus and Igor. Blue sky and 27 degrees C. Not the first image that comes to mind when I think of the Russian tundra. But those were the weather conditions that greeted us as we jumped out of the helicopter. 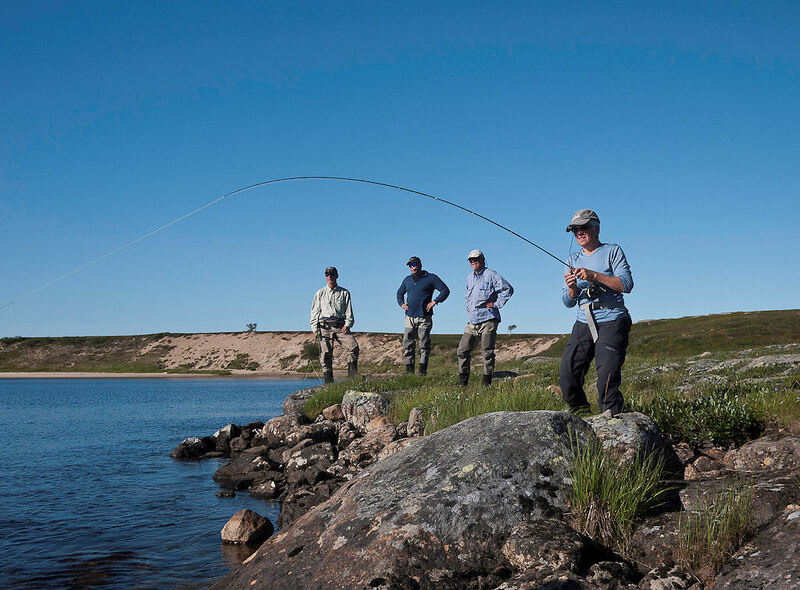 Perfect weather, according to our WAGs back home, but pretty far from what six trout fishermen was hoping for. Magnus catching fish in the midnight sun in Litza. 2, 2kg. The temperature in the air was one thing. The water temperature rose to 19.5 degrees C in two days. High temperatures like this makes the trout even slower than men wearing gore-tex waders. We managed to catch a few fish, mainly during the night. During the day some had success fishing pocket water in the rapids. 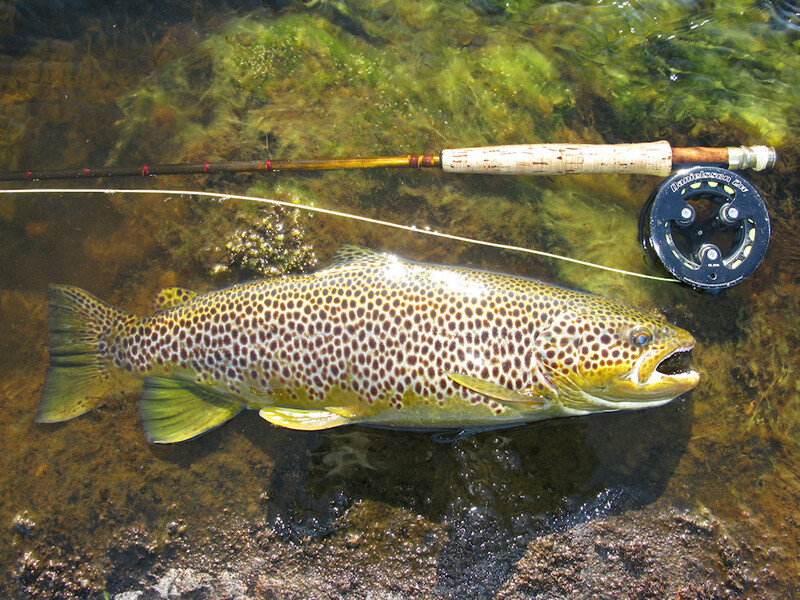 In total we caught only 11 trout in Bush, Litza. The biggest was a very nice 3, 3kg. We spent the days slumbering and swimming in the lake, waiting for the weather to change. Very low water level in Bush Pool. And on Tuesday it finally did. A few hours before the helicopter came to transport us to Kharlovka, massive clouds came in from the east carrying loads of rain. For 30 minutes we danced in joy in a heavy shower. A very important whiskey sacrifice in Dream, Kharlovka. As soon as we landed in Kharlovka Magnus organized a small ceremony on the river bank, sacrificing the rest of his whiskey to the river. The following evening fog came in from the north, and mayflies started popping up in the home pool of Dream, Kharlovka, as the temperature dropped below 10 degrees C. After five minutes the first tail was waving at us from the top of the pool. This was the signal we had been waiting for. We threw our sun screen bottles out of the chest pack and replaced them with fly boxes filled with dun imitations. Finally we started catching fish! The week had suddenly turned from Majorca to Montana. The water temperature fell to 16 degrees during the first night, and it continued to drop the following days. We caught some fish during the day, but the main action started around 1800, when the mayflies started emerging on the surface. 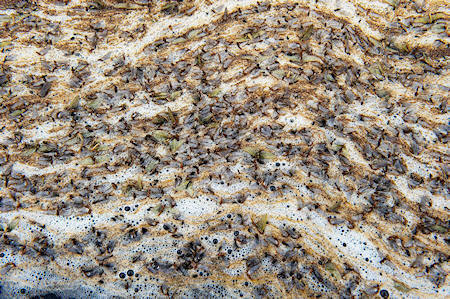 The hatch lasted for some hours, and then caddis flies took over. When there was no activity on the surface the fish rose to attractor patterns like Madam X, Tsjernobyl Ant and other big, rubber legged mutants. I caught a new personal record on a fly called Spiderman II. In this case the sequel outfishes the original. I caught a 4, 6kg on Spiderman I in 2009. The second version fooled a 4.7kg sumo trout. Tommy’s new record – 3, 6kg. In total we caught 52 fish during our stay. Six of them were weighing more than 3kg. 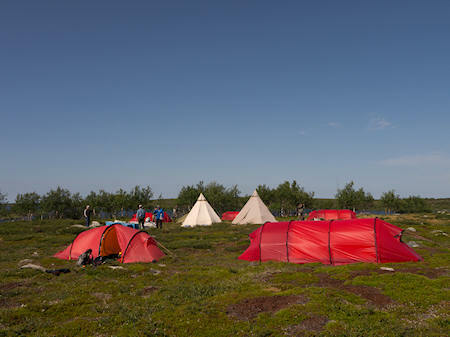 During the week we experienced the variety of the tundra. One day we were sun bathing on the beaches by the camp in Bush, Litza. The next day, wind from the north and six degrees C. We killed thousands of mozies, caught trout that could make a 70 meter run and bend a size 10 TMC100 hook, we filled our stomachs with guide Igor’s fantastic food, and shared a few beers and a laugh by some of the most beautiful rivers in the world. Note to self: Use strong hooks on the tundra. 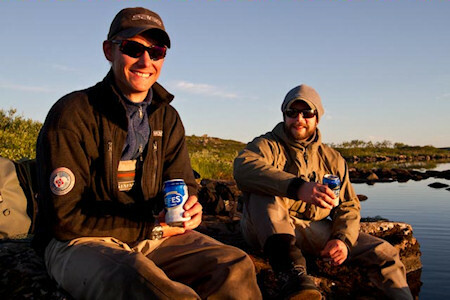 Sharing a beer and a laugh. An important part of the experience. 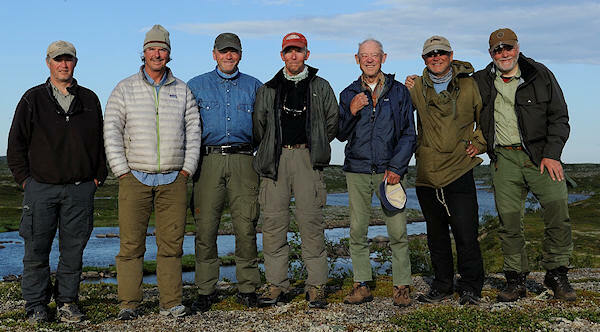 Members of the group were Edvard Bergene, Oivind Lund, Per Sondrup Nielsen, Morten Aass, Per Aass (85 years old!! ), Pal Krogvold and Kjell Sømme. 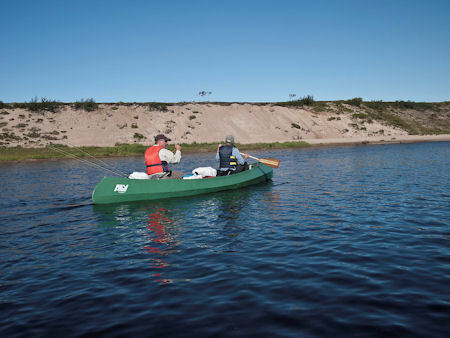 Except for Mortens father Per, the group paddled the Rynda two years ago and the Pina River last year. 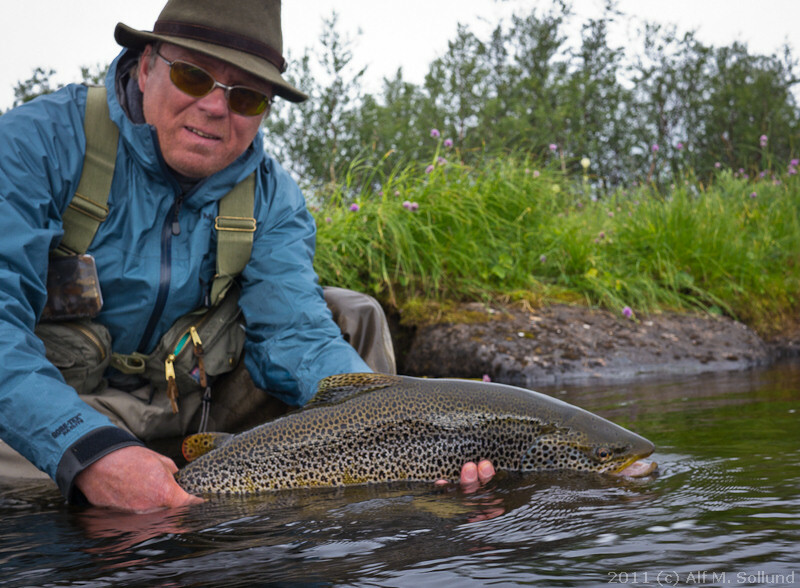 Morten wanted to take his father, a renowned Norwegian scientist and a famous specialist on trout, to these fantastic rivers. 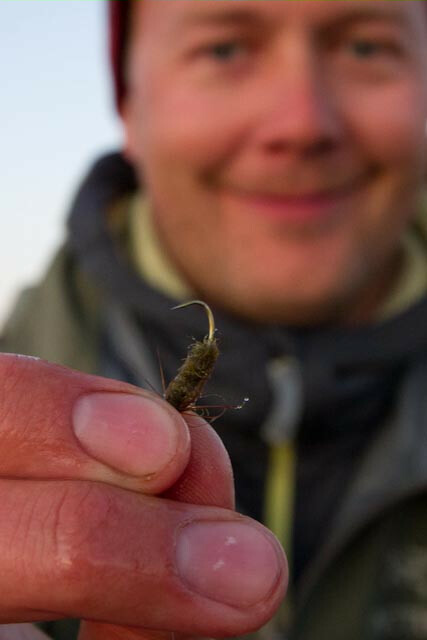 Per experienced some of the most fantastic caddis hatches one could possibly witness. 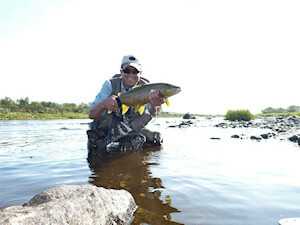 He waded into the stream on slippery rocks, canoed down rapids and caught fish in the best conditions he had ever seen! If anyone had second thoughts about taking a senior fly fisher along, they proved to be wrong. Being an expert he had a lot of to give to this group of experienced fly fishermen. We had a great week with Per! 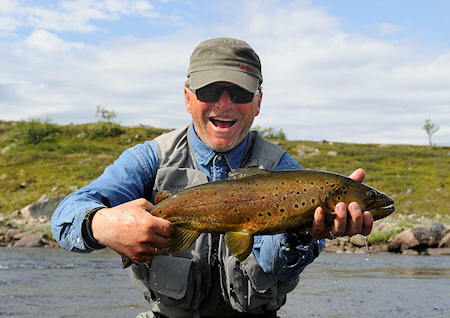 In the upper part we had some great caddis hatches and caught quite a number of trout. Not as big as we are used to in Kharlovka, Pina and Litza, but still some nice fish above 2 kg. During the hatches the fish we caught looked like fat, spawning cod from the Lofoten Islands! 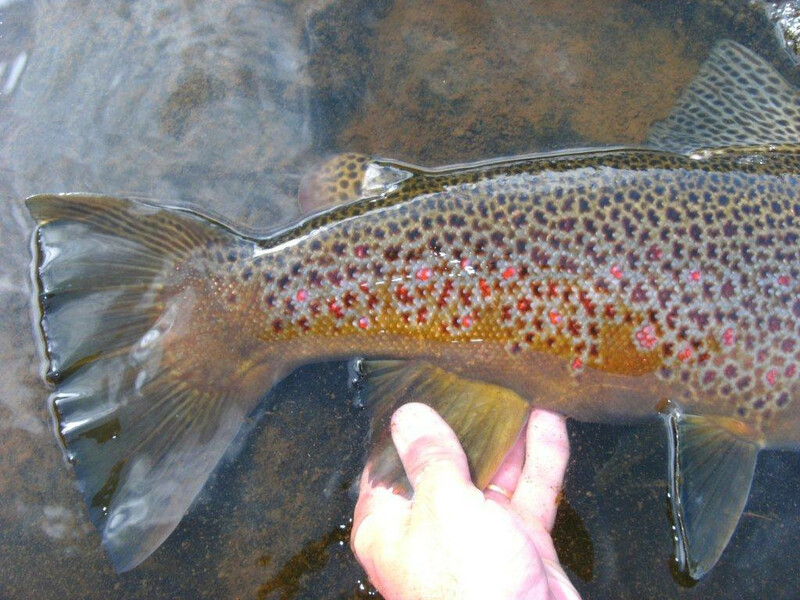 When Pal and I paddled upstream some days later, and the hatches were over, the fish looked more normal. But still they were fat and in good condition. 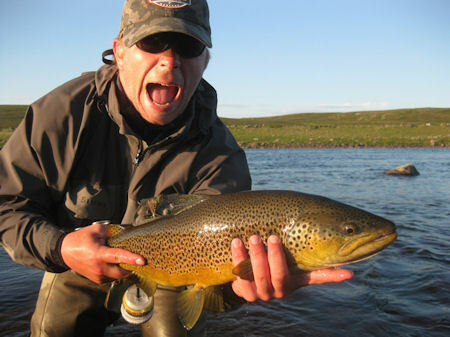 What surprised us the most was the fact that the trout did not rise much to the Streaking Caddis as usual. Instead they took Sommepuppa. In all, more than 65 % were taken on this swimming pupa during this week. 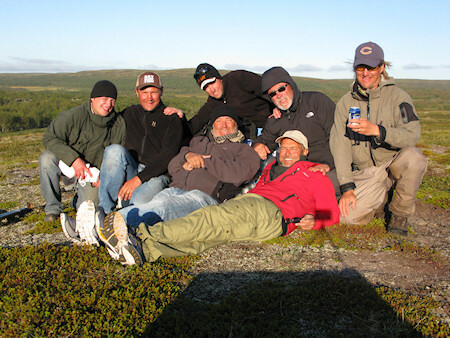 We had a great week and have become good friends and hope to make a new canoe trip next year. 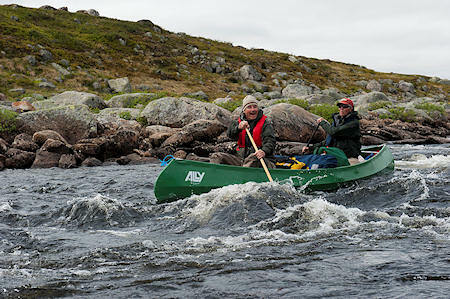 This was Pal and mine 11th trip canoeing together the rivers of Kola, and so far we have had no accidents. From such an experienced paddler as Pal, we have learnt to canoe down rapids without taking risks, and when to line the canoes. We look forward to next year, perhaps on a different river! Most fish were taken on dry fly, with a few exceptions. Most successful flies were Sømmepuppa, Dyret, and some streamers. In all we caught 104 fish. 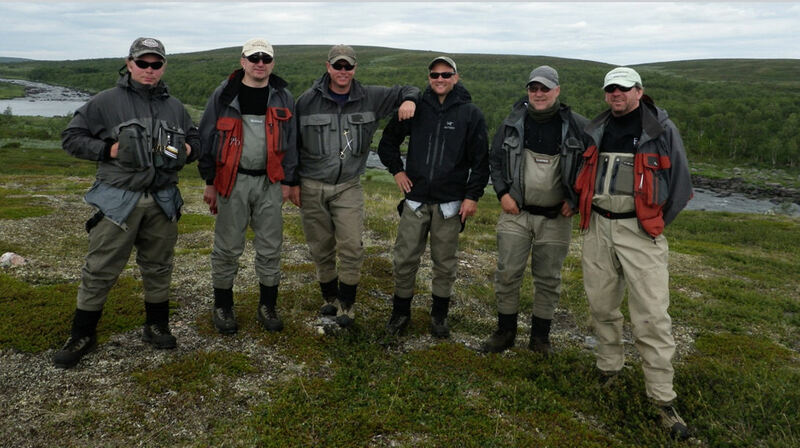 Group members: Tor Johansen, Geir Ellingsen, Trond Grinder, Erik Nyrnes and Tom Tuskin. Chef/guide: Igor Group leader: Pal Krogvold. Geir, Trond and Erik were fishing with me the same week last year, and Tor and Tom had paddled several trips with me on Rynda and Pina. 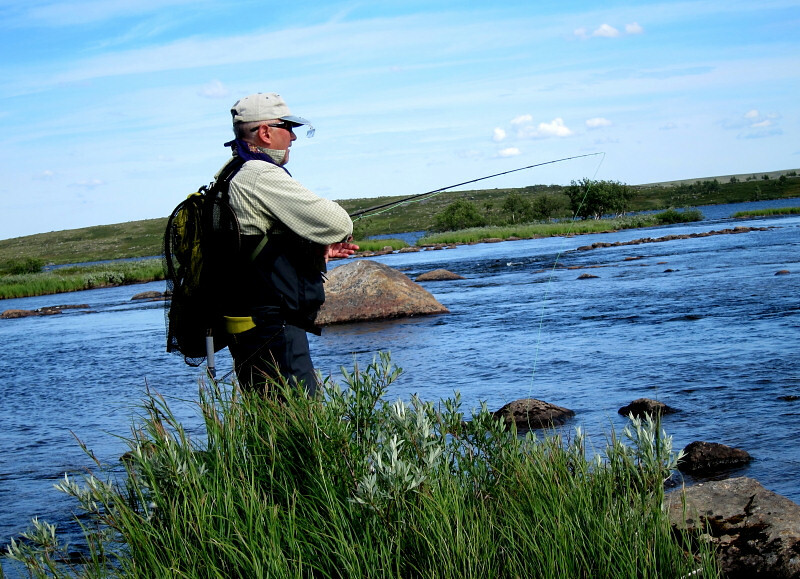 The group therefore consisted of fishermen with experience of fishing these rivers. 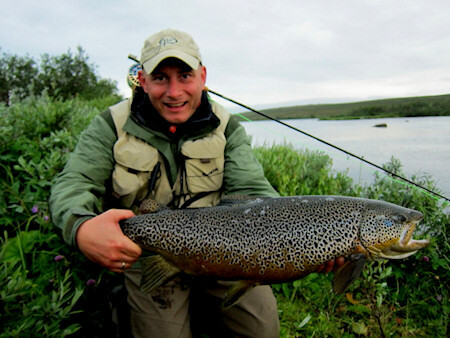 We started our fishing at Kharlovka’s Big Trout. 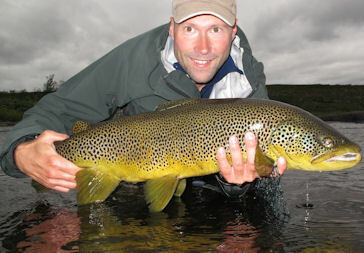 Already on the first night we had a very good caddis hatch, and fun fishing with dry flies. 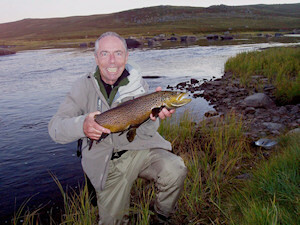 The remaining days at Big Trout were also good, with some big trout catches (above 3 kg). 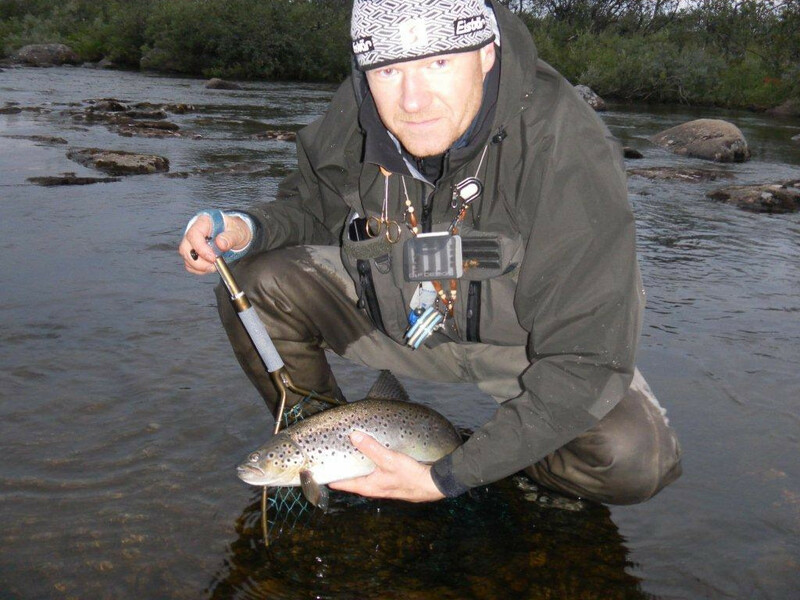 During these days we had some smaller hatches of caddis and mayflies, and caught most of the fish on dry flies. One of the great flies was the F-Fly. Other good flies were Tugga, Streaking Caddis, Renaflua, Rackelhanan and the No-hackle Mayfly. 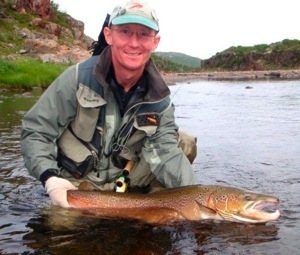 At Big Trout we caught a total of 62 fish above 1kg. On Tuesday we were moved to Litza’s Saami Kitchen. Here the river is much smaller and unfortunately we had only minor hatches and very few rising fish during our stay at the camp. A lot of fish were caught when fishing blind with dry flies and using dries where we had seen a fish rising. We also caught some nice fish with nymphs. Tom caught a lot of fish on a gold head Woolly Bugger on a slow sinking line, on a day with no rising fish. 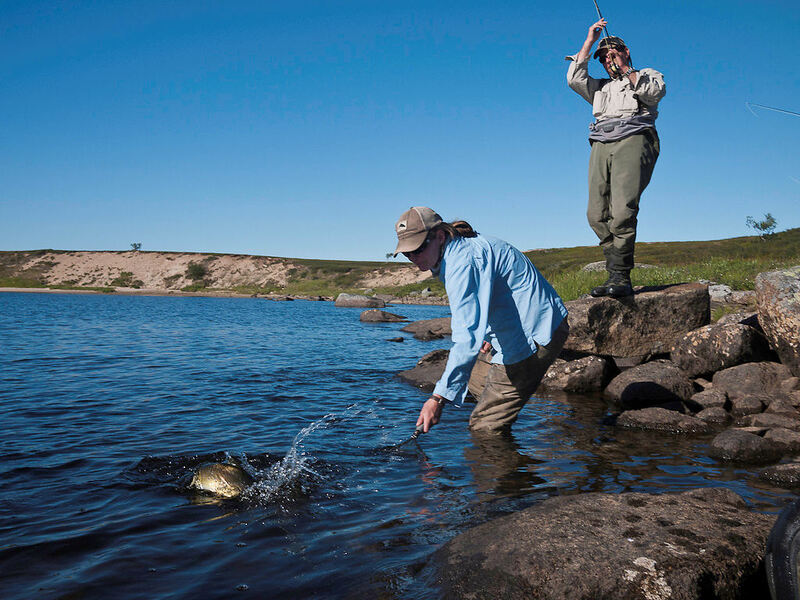 While at this camp we caught a total of 48 fish above 1 kg, and a couple above 3 kg. During the week we had variable weather with some rain and a lot of wind. Igor did a superb job. He provided lunch bags almost every day, and made breakfast and dinner when we wanted it. All participants were pleased with their stay, and all but one plan to come back next year. The new tents were great! 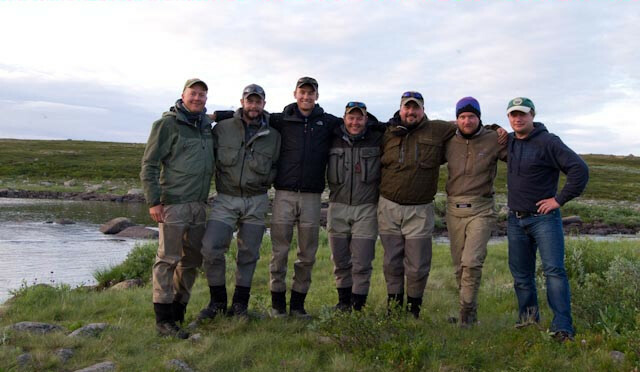 Participants; Olivier Durant(France), Christian Bertand(France), Edvard Bergene( Norway), Glenn Jacobsen(Norway), Kjell Kristiansen (Norway), Kjell Sømme (group leader) and Vasillij chef and guide. The fishing started in Swan, Litza with great expectations and we caught quite a number of fish before midnight when the north wind suddenly appeared. 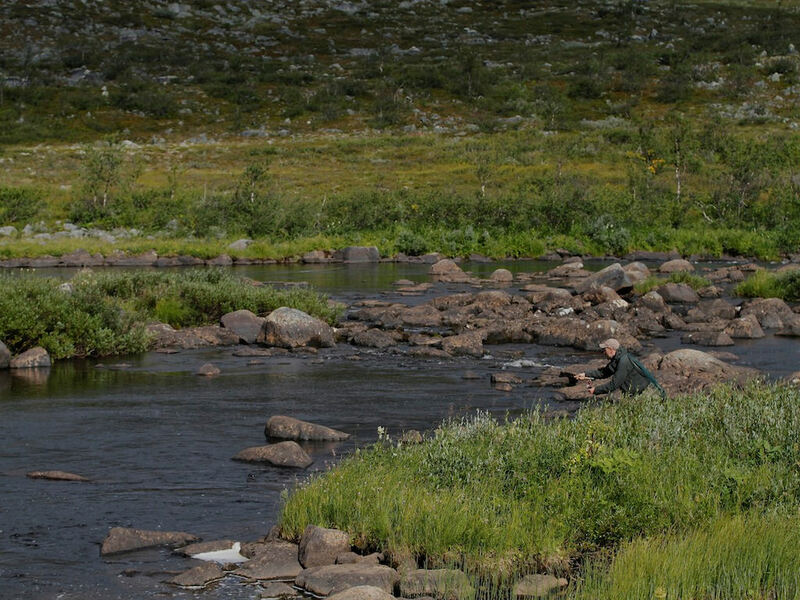 For two days we had continuous north wind coming up the valley and the fishing was difficult. 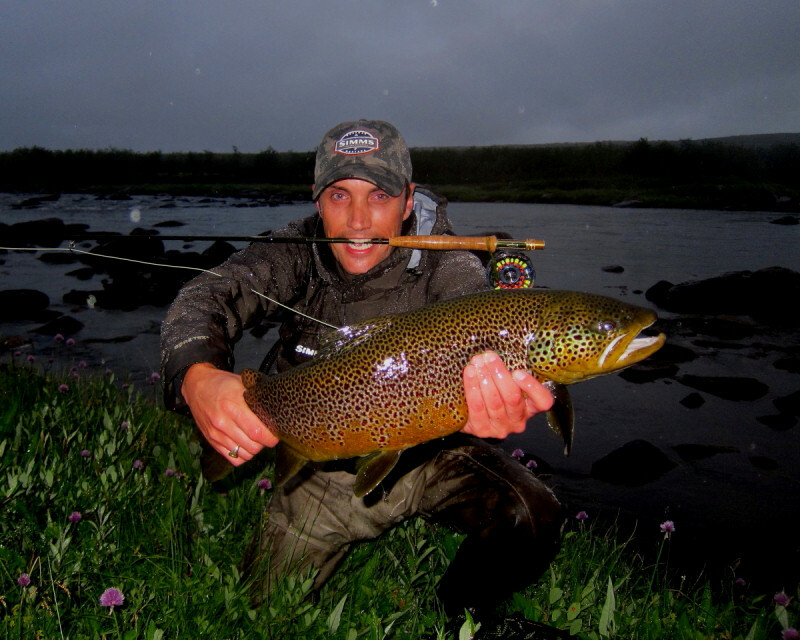 The two french had some success, moving around, finding all different spots where trout could possibly hide. In all, we caught some 40 fish, the biggest well above 3, 5 kg. The morning we were leaving the weather turned better and the fish started rising again, and we were all quite successful. 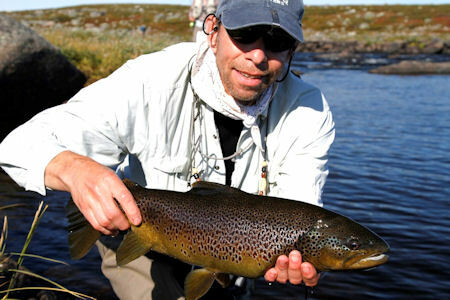 The best patterns were Tugga and Sømmepuppa along with different caddis and mayfly imitations. 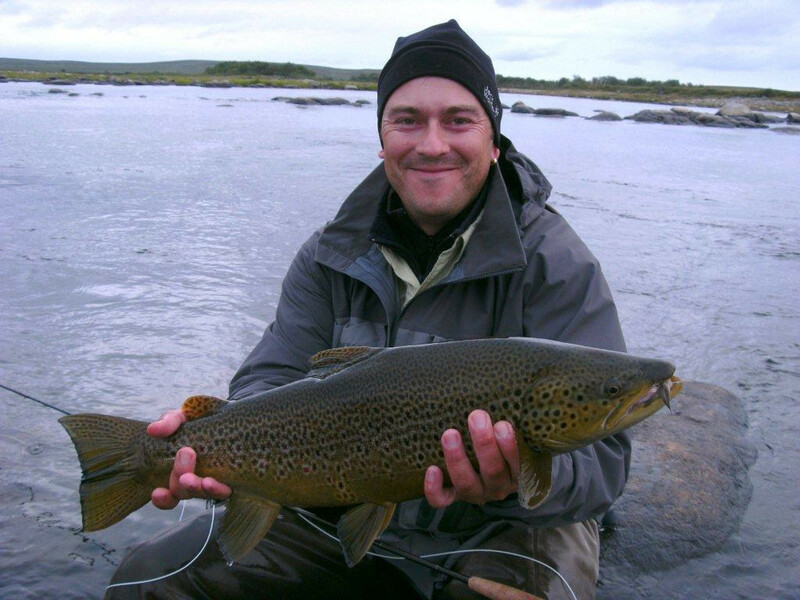 Arriving in Scones, Kharlovka was quite the opposite, calm conditions and enormous caddis hatching. We all had the fishing of our life! 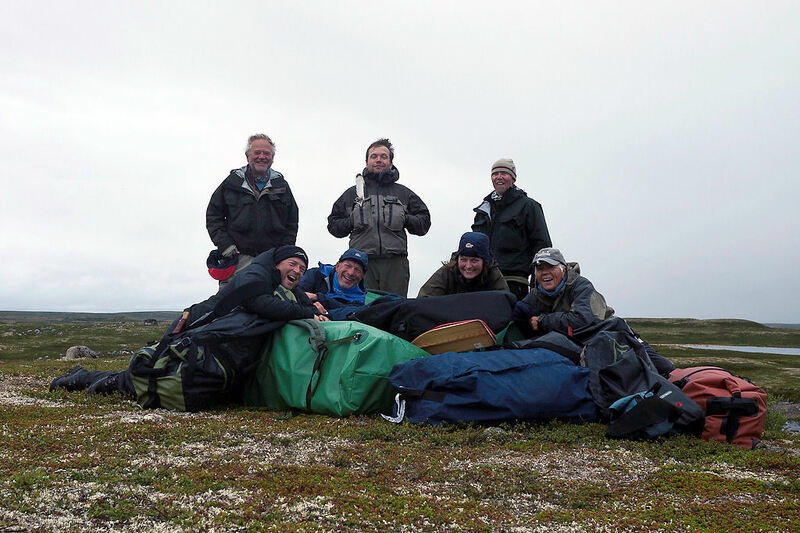 We all caught fish above 3kg, and all members of the group got a new personal record! 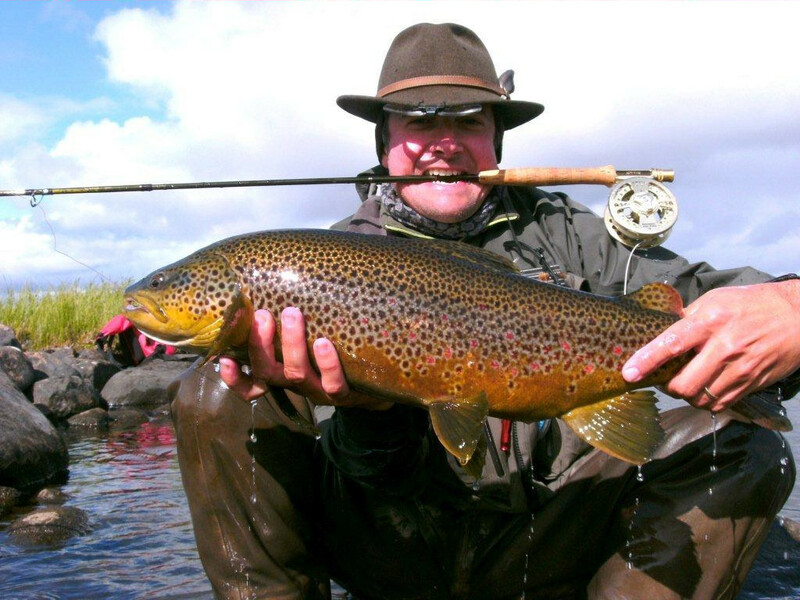 All fish during the week were taken on dry fly! (except one). 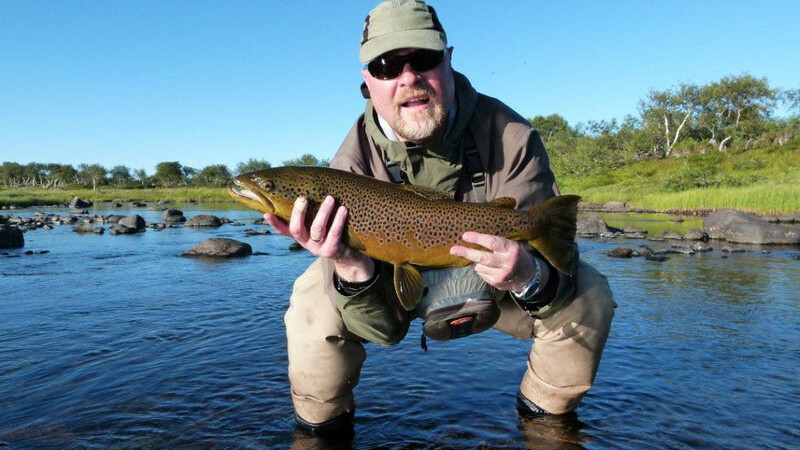 Many were above 3 kg, but the biggest was a monster of 5.1 kg, caught by Kjell Kristiansen on the fly “Dyret”. 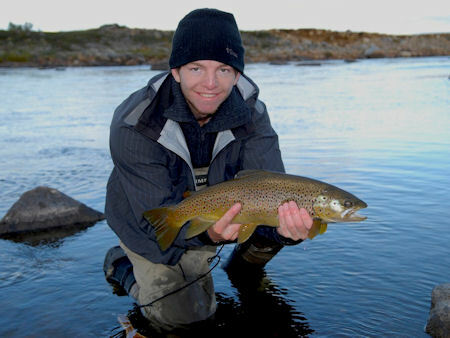 The most successful flies were Tugga, Sømmepuppa and Dyret( all caddis imitations). 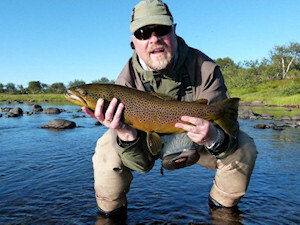 Glenn netting a nice fish for Kjell K.
In all we caught 164 trout above 1 kg and we all had a great week. Thanks to Vassiliyj, who served dinner late at night as we preferred to use European mean time!